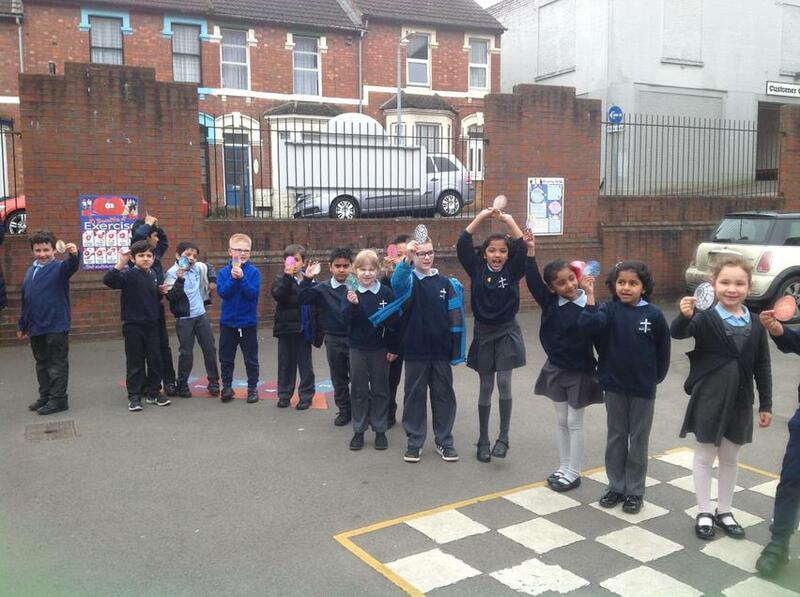 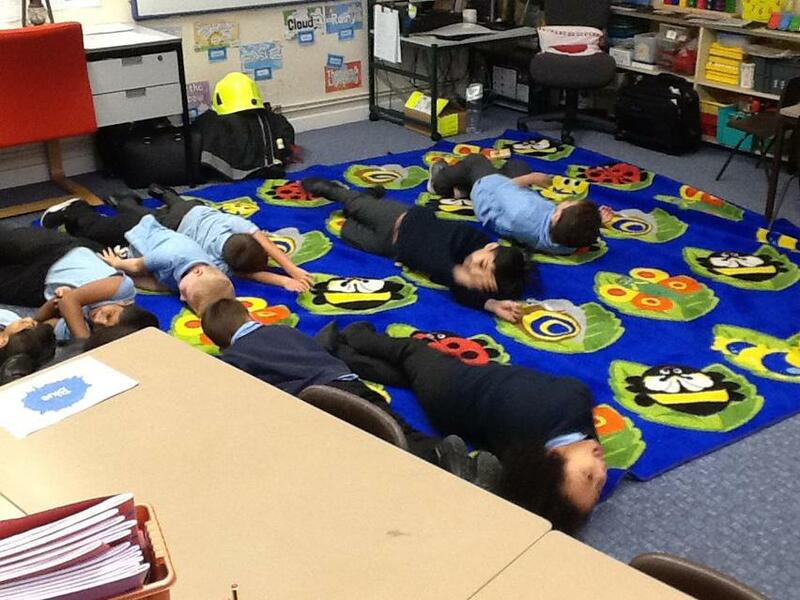 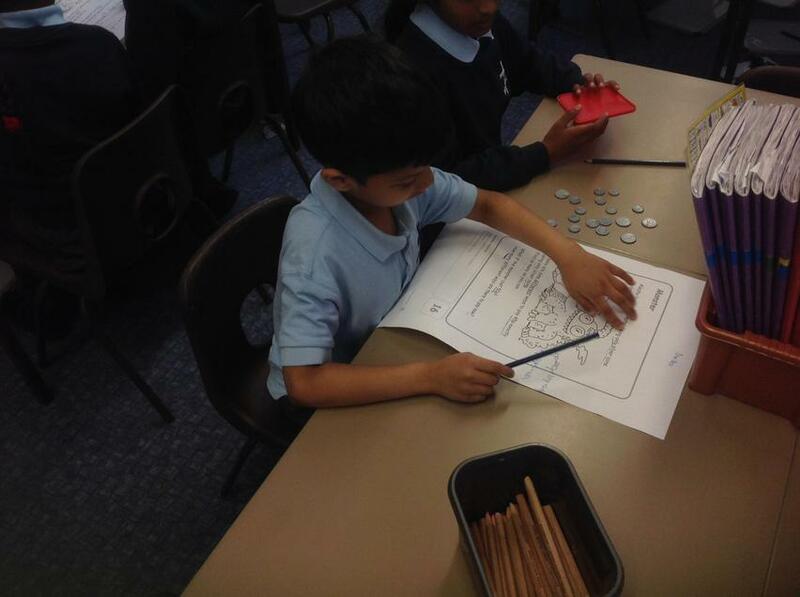 Hedgehog Class have been busy practicing their Problem Solving Skills in Maths. 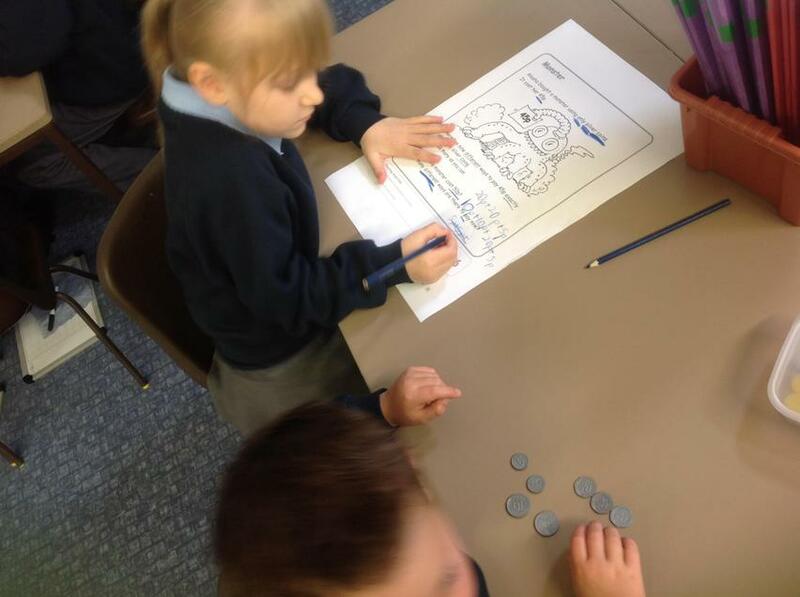 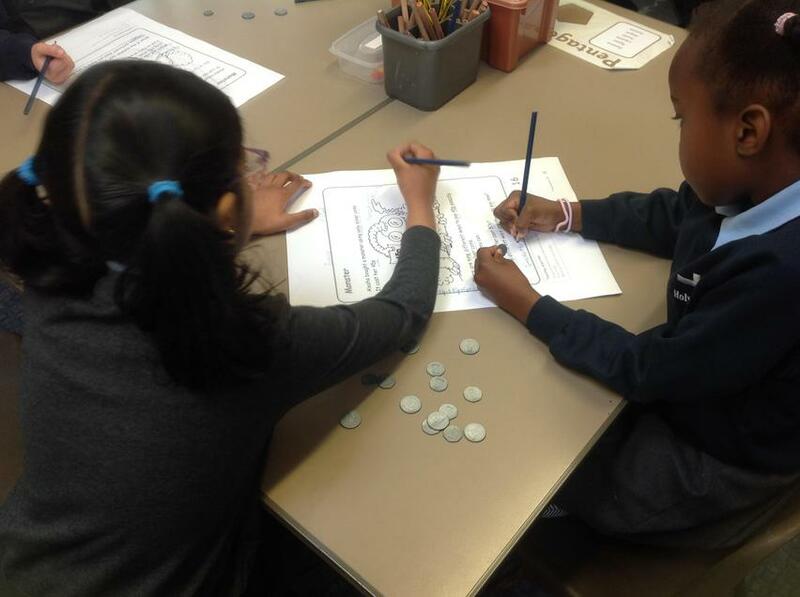 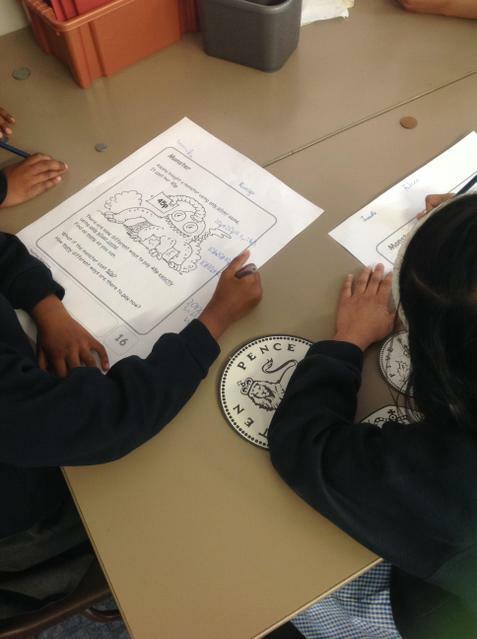 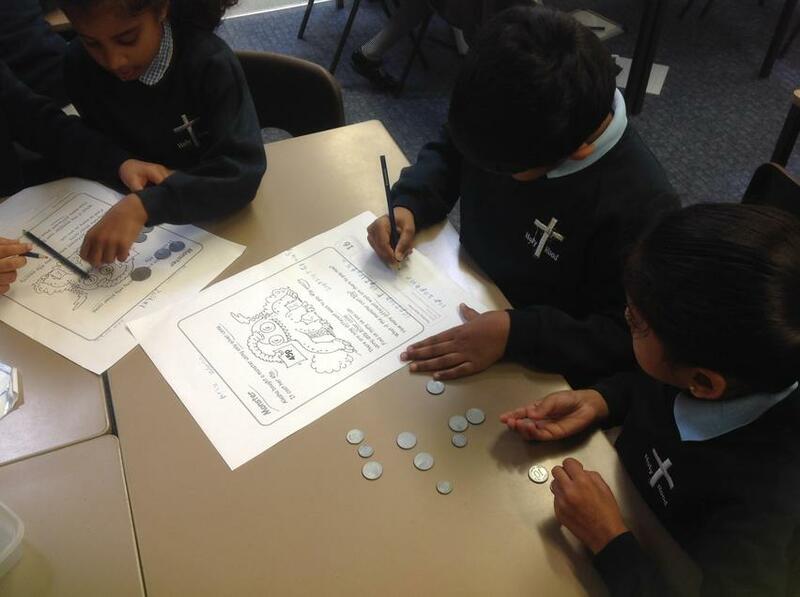 We have been working in pairs and small groups to solve some tricky money problems this week! 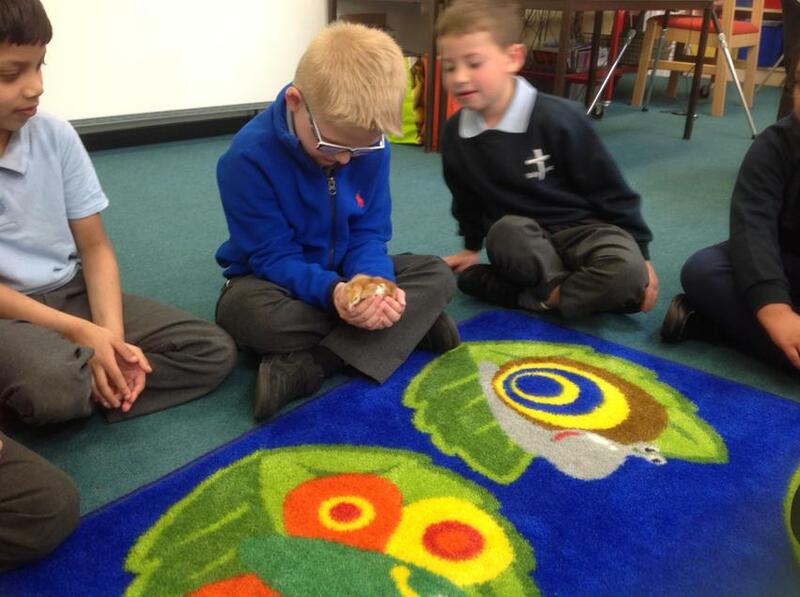 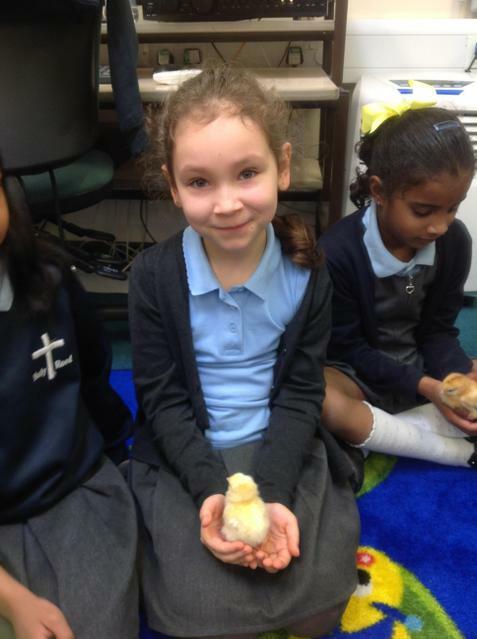 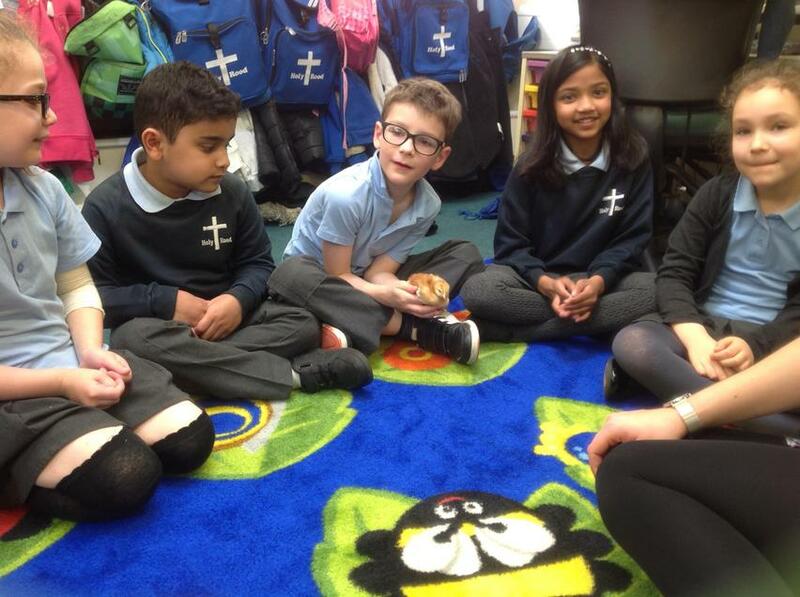 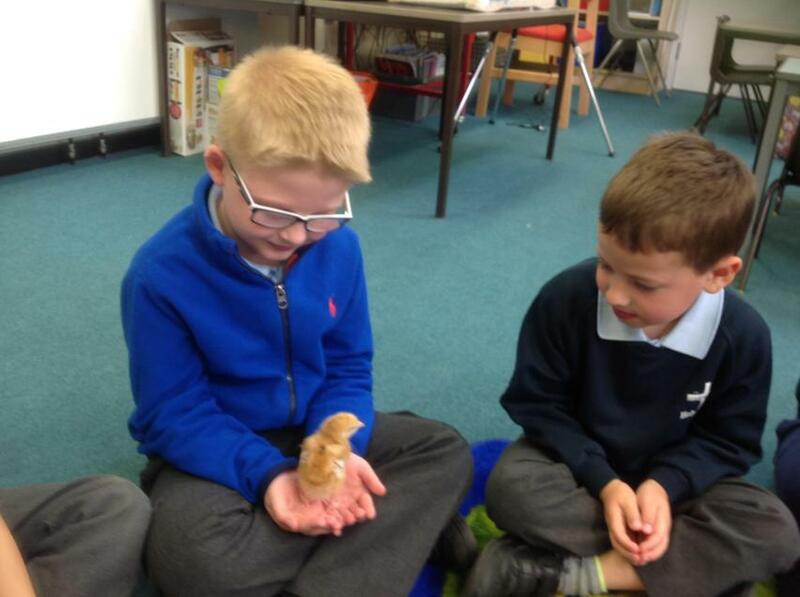 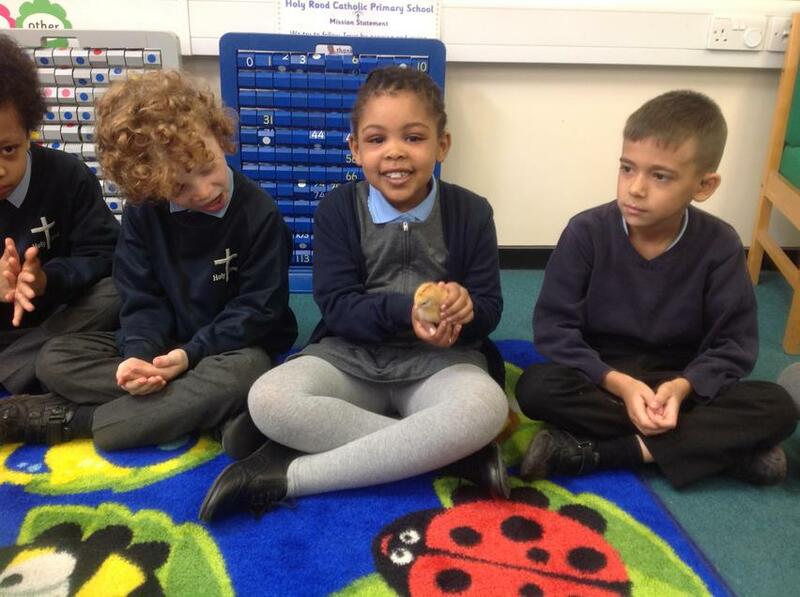 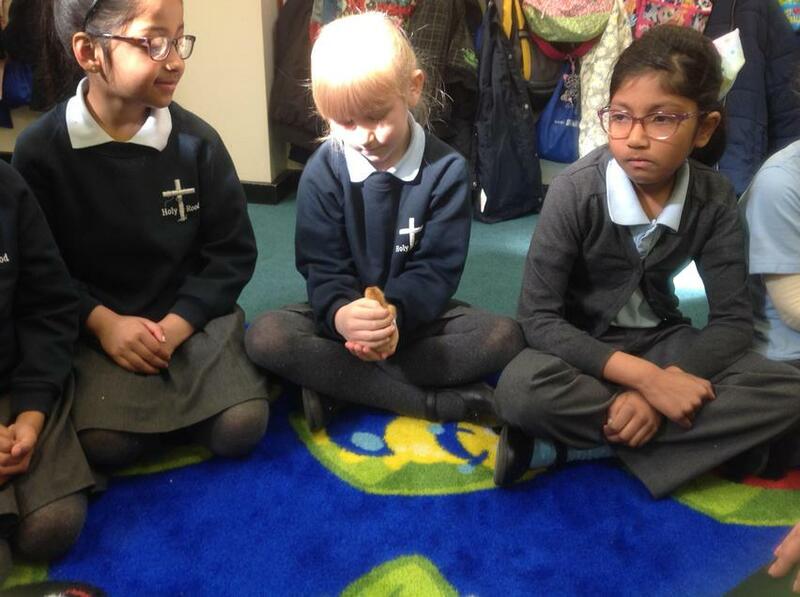 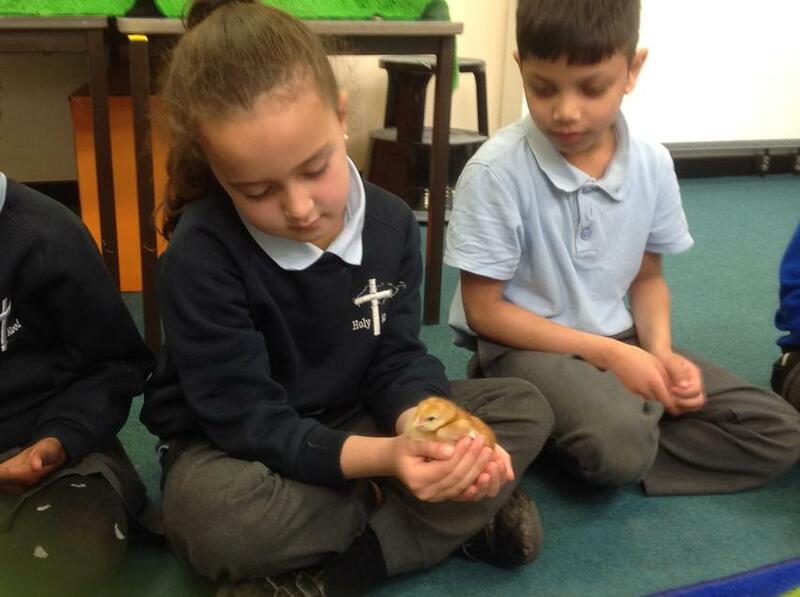 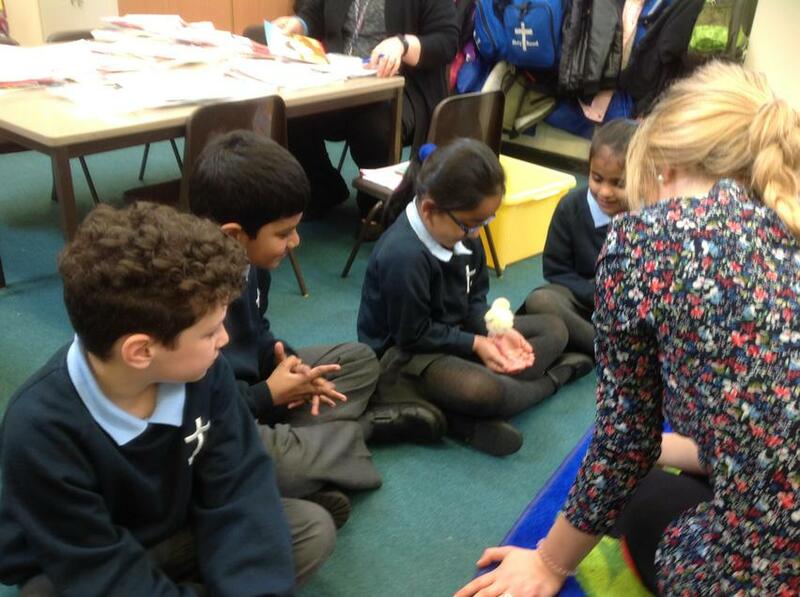 Hedgehog Class finally got to meet the chicks this week! 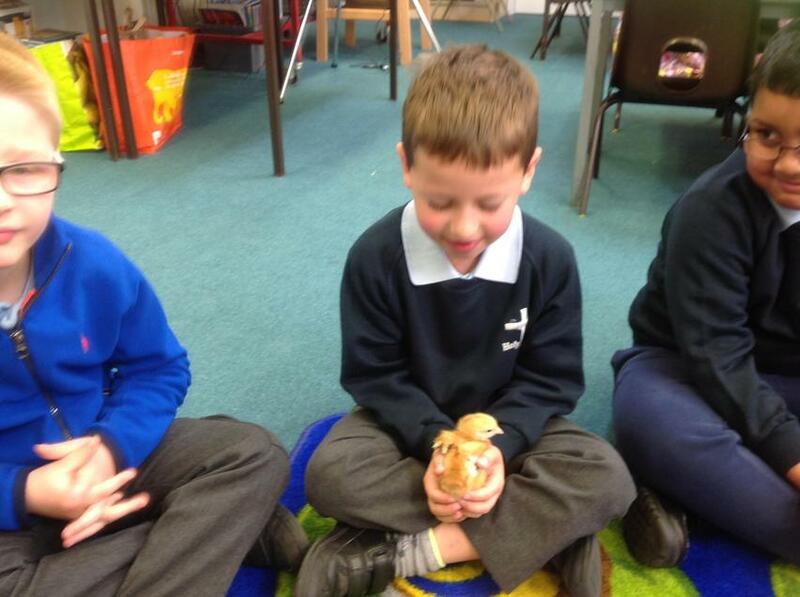 We were so excited to see them and we took it in turns to hold them carefully. 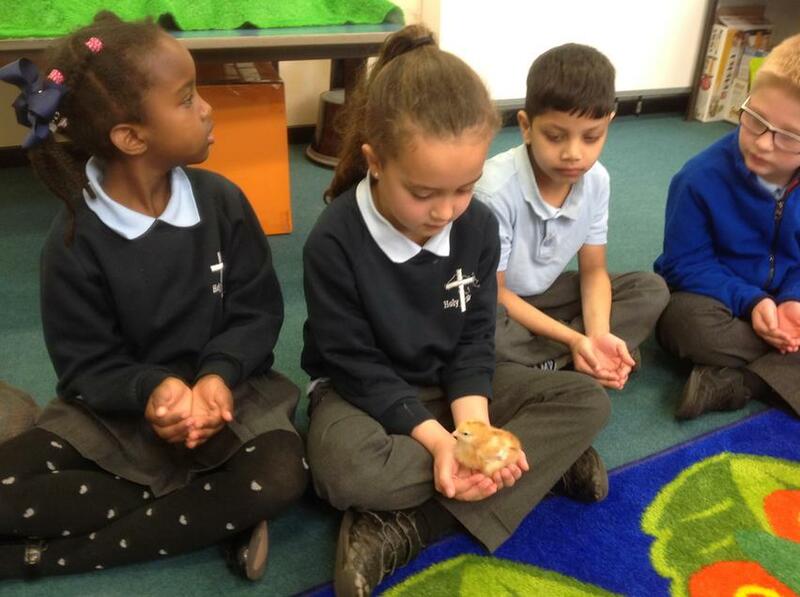 A couple of them even fell asleep in our hands! 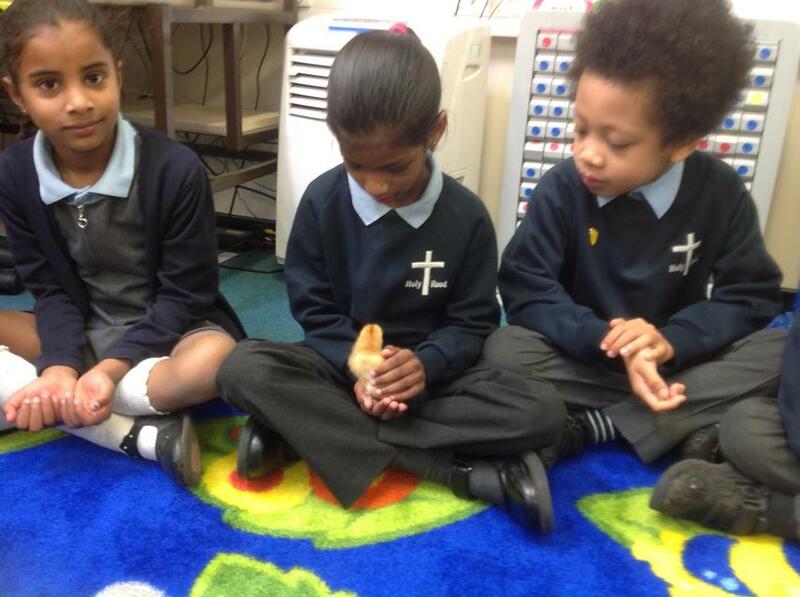 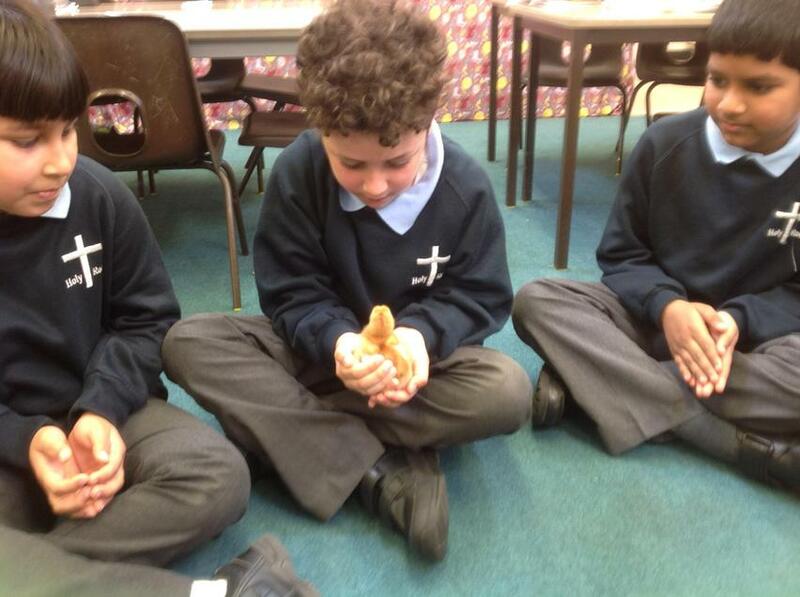 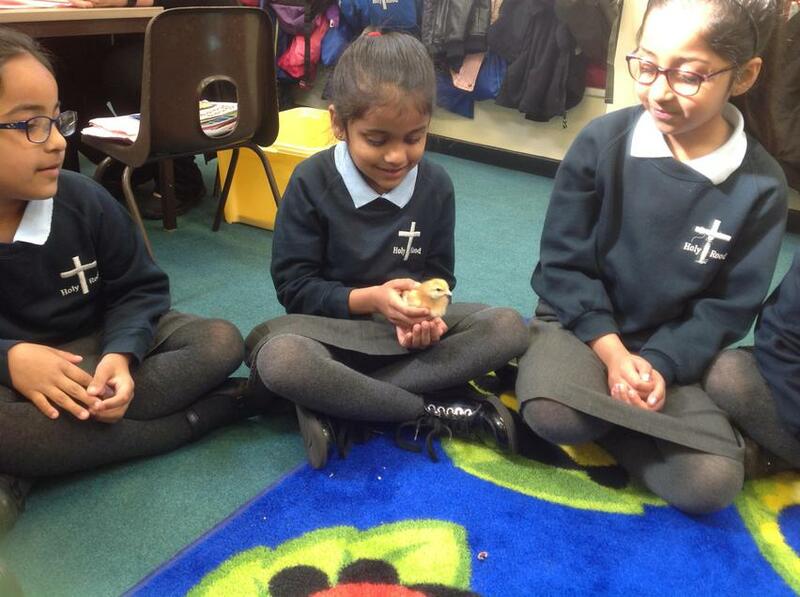 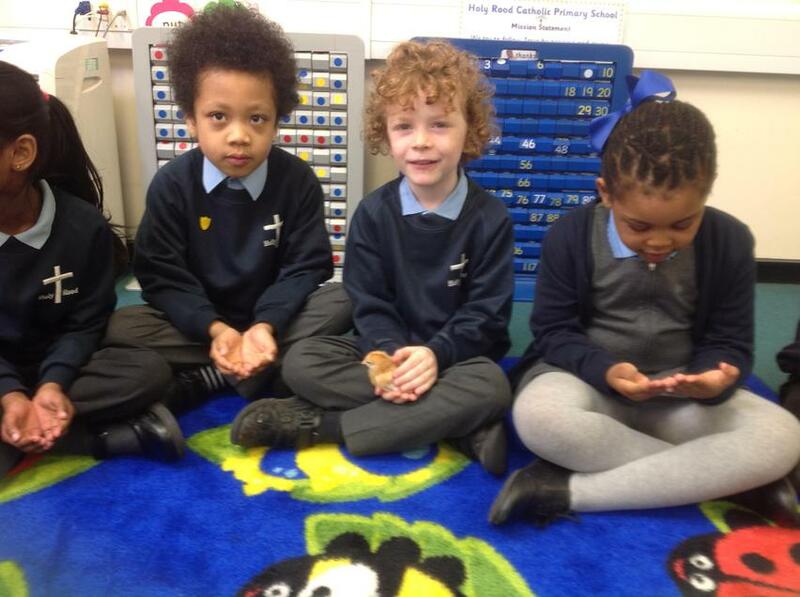 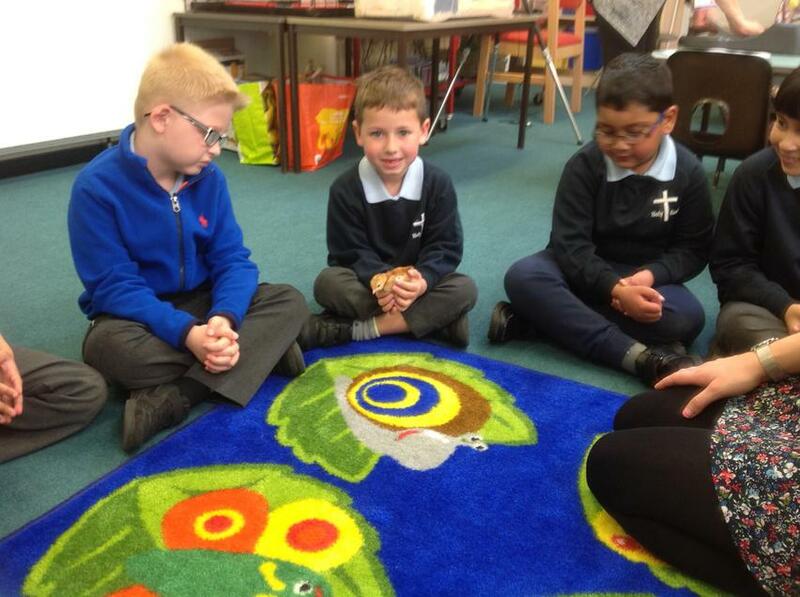 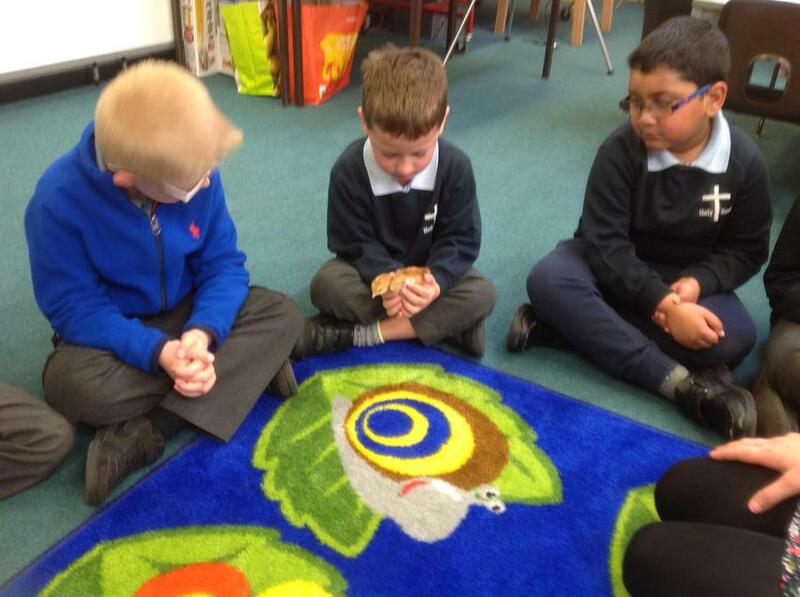 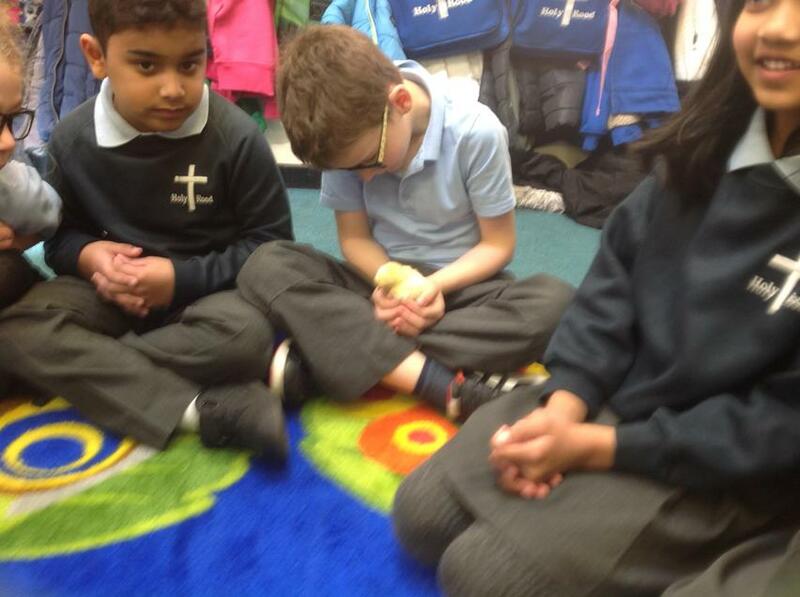 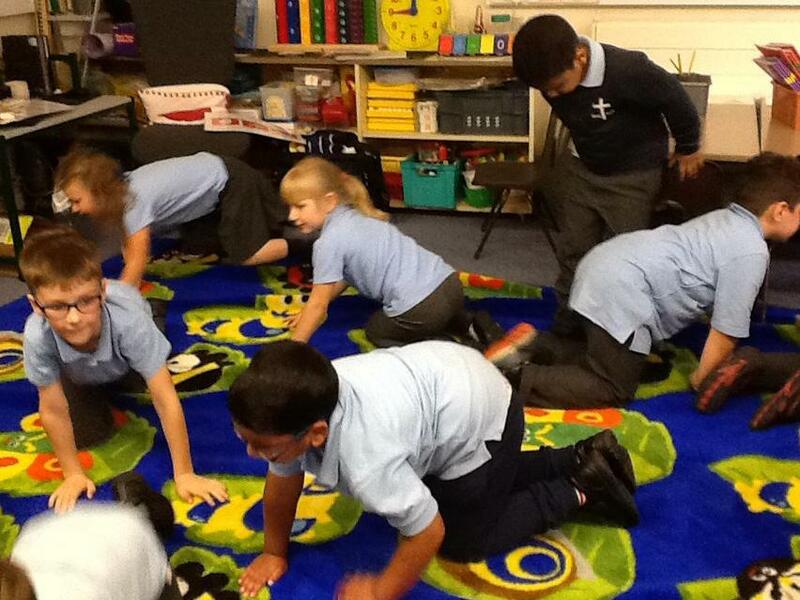 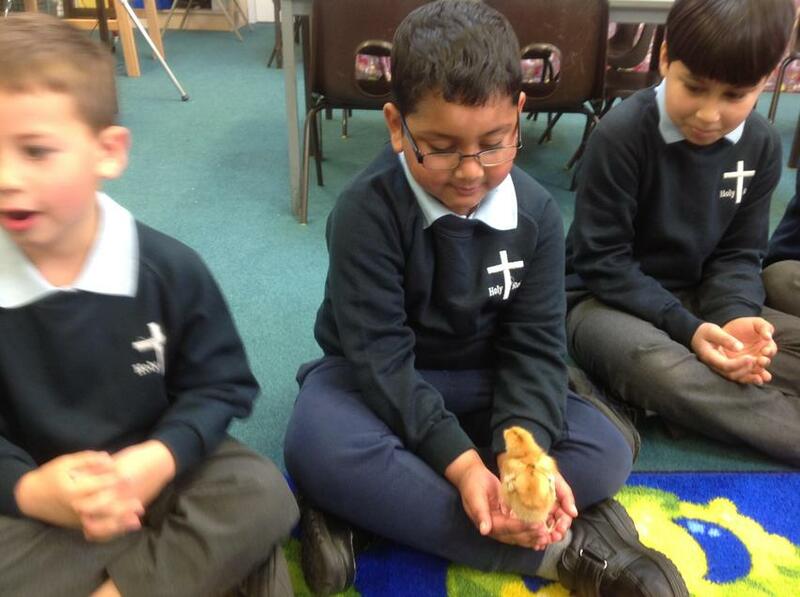 We then thought about the life cycle of a chicken and linked the chicks to our Science topic on habitats. 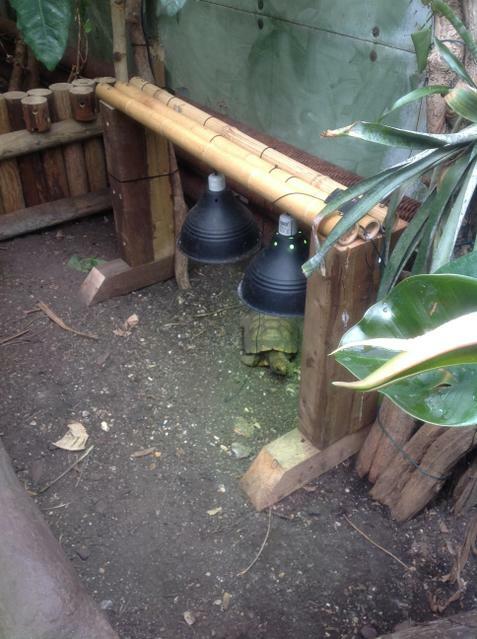 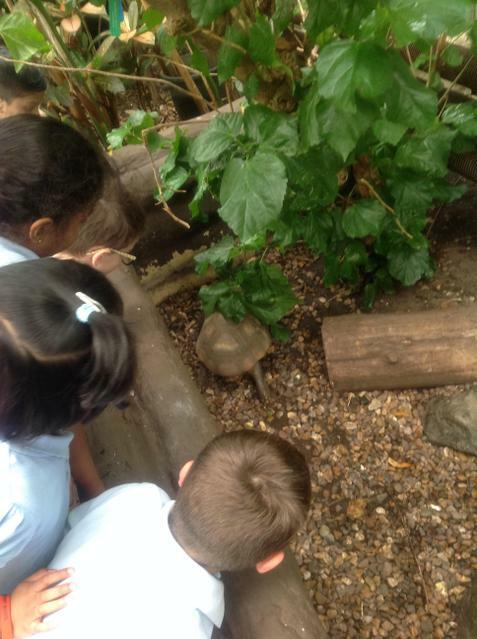 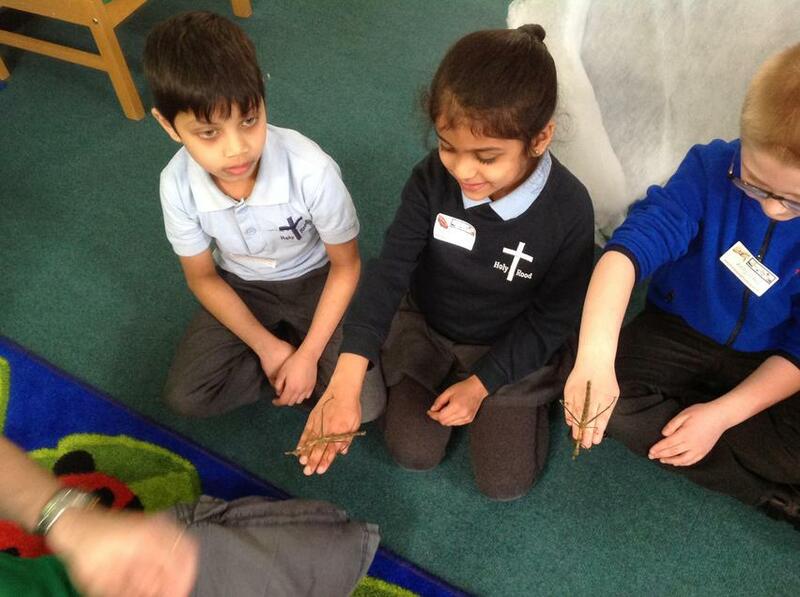 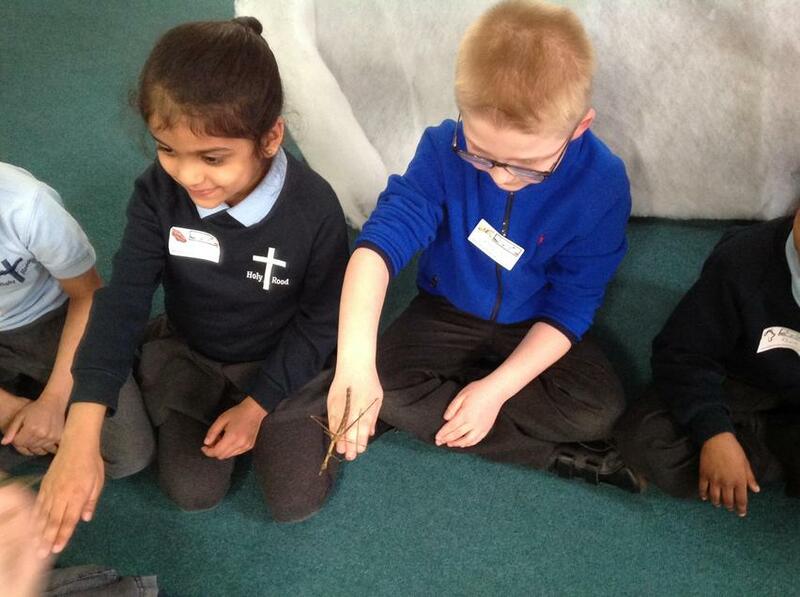 Hedgehog Class had a fantastic time exploring The Living Rainforest on our school trip last week. 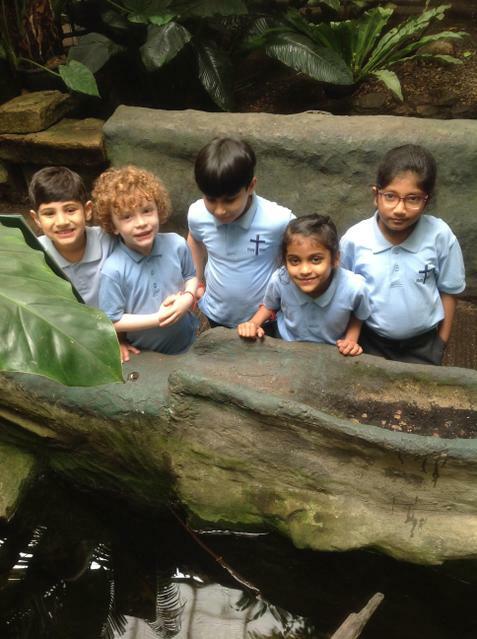 We had a guided tour with an expert who took us around and explained how the animals and plants have adapted to survive in such hot and humid conditions. 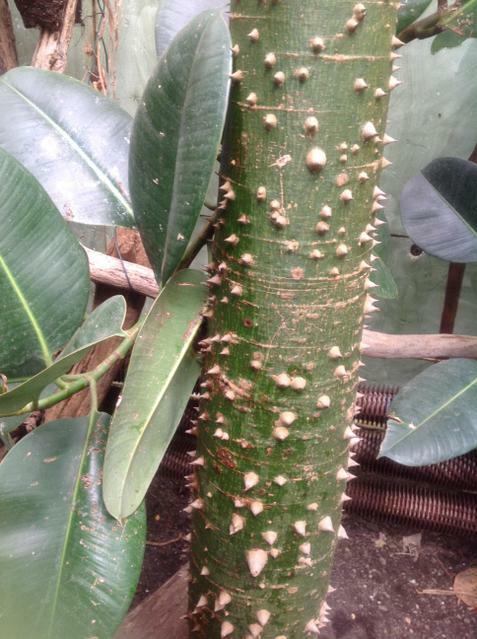 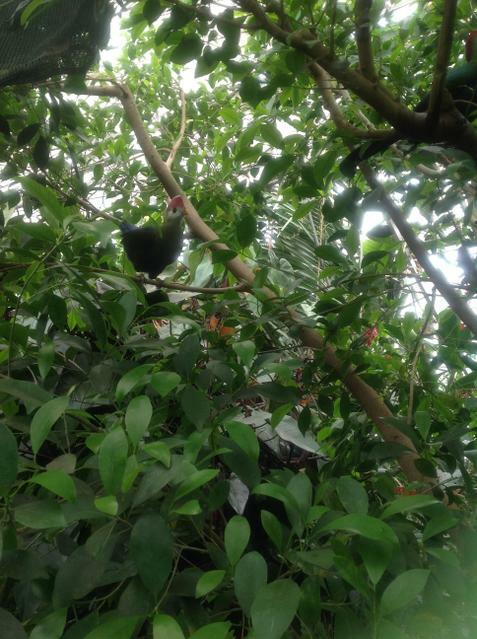 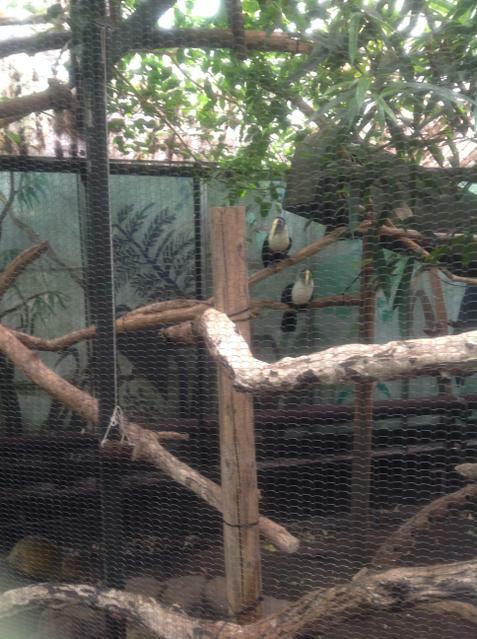 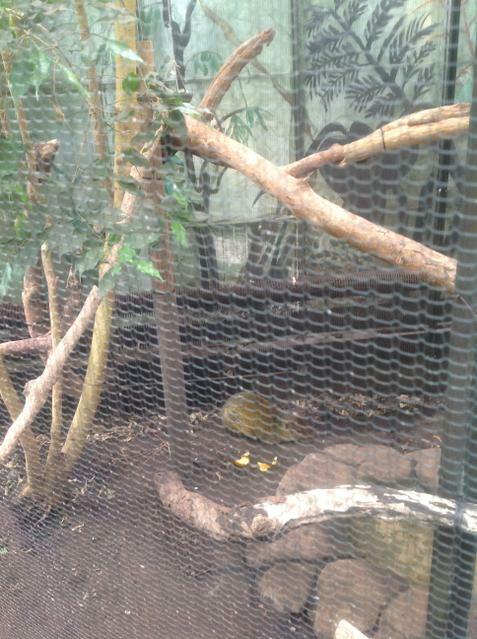 We saw lots of exciting plants, insects and animals including Turaco, poisonous dart frogs and stingrays! 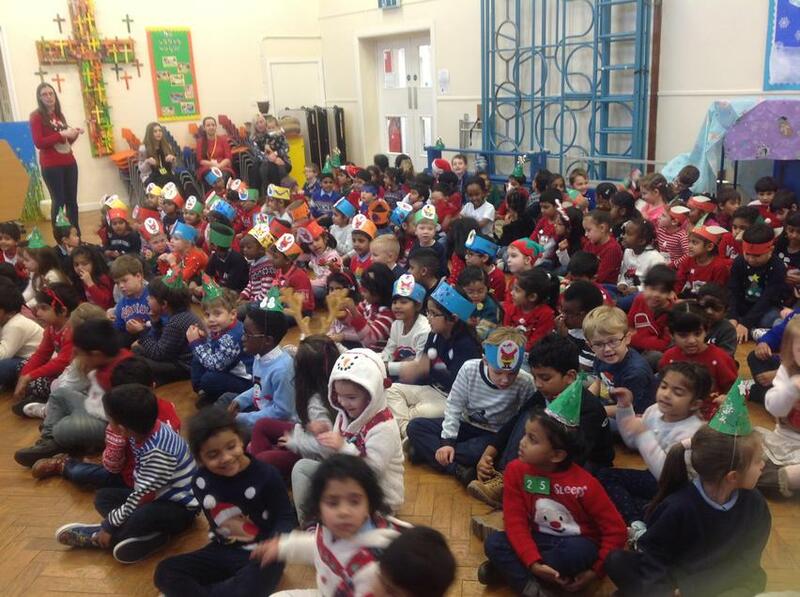 Thank you to the parents who volunteered to support and those that came along on the day. 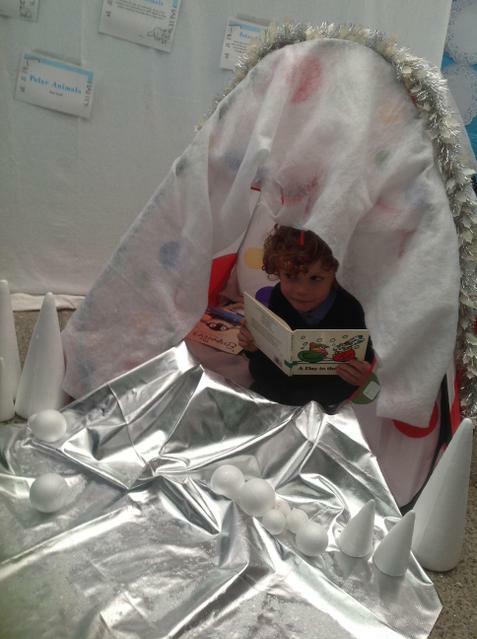 "We read a story about a boy who found a dragon's egg! 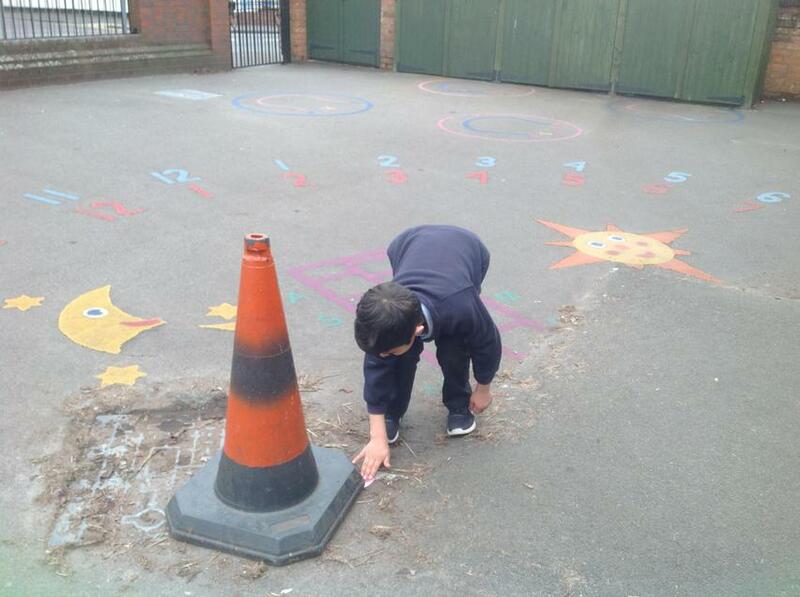 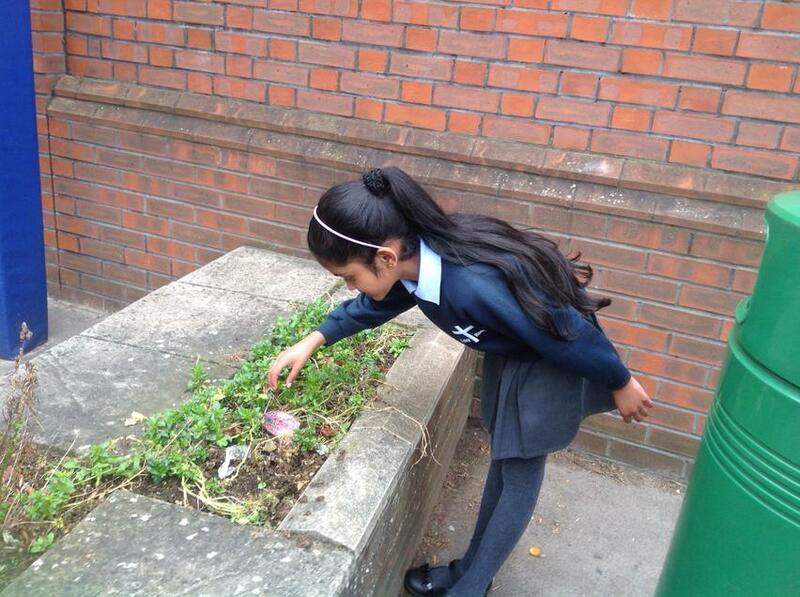 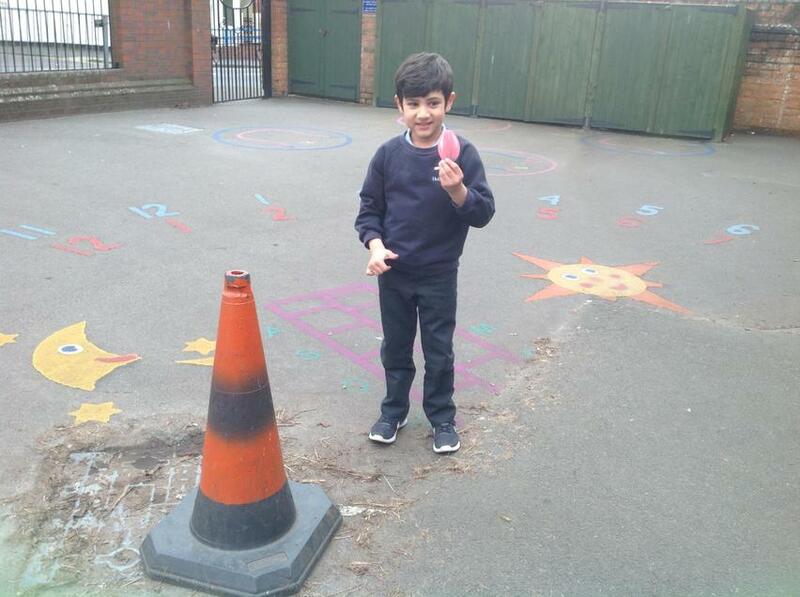 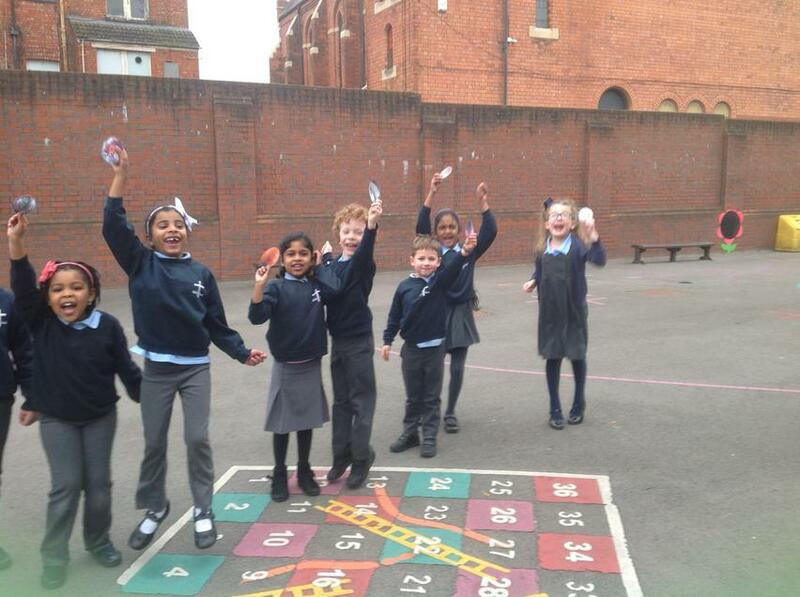 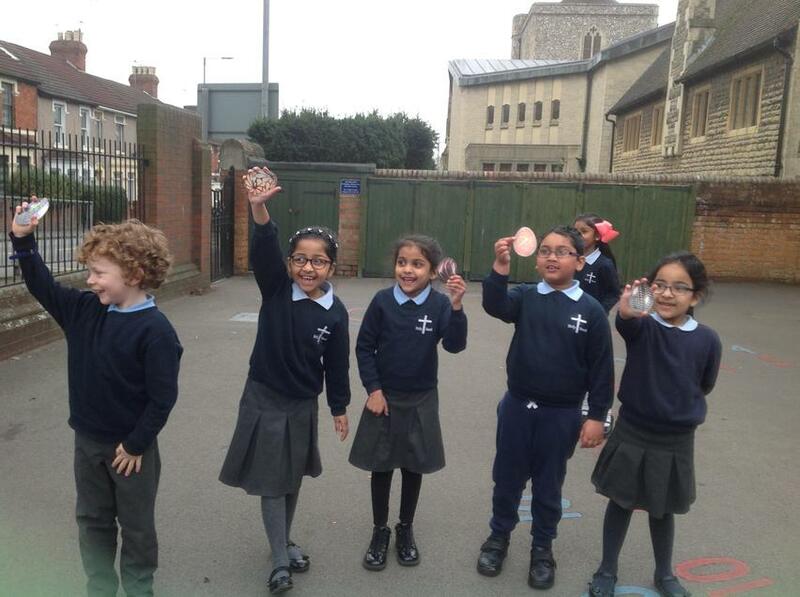 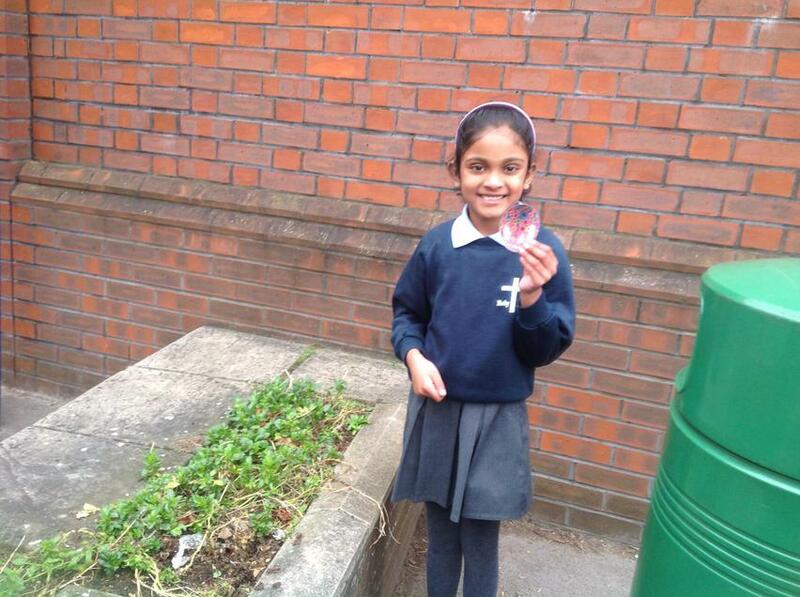 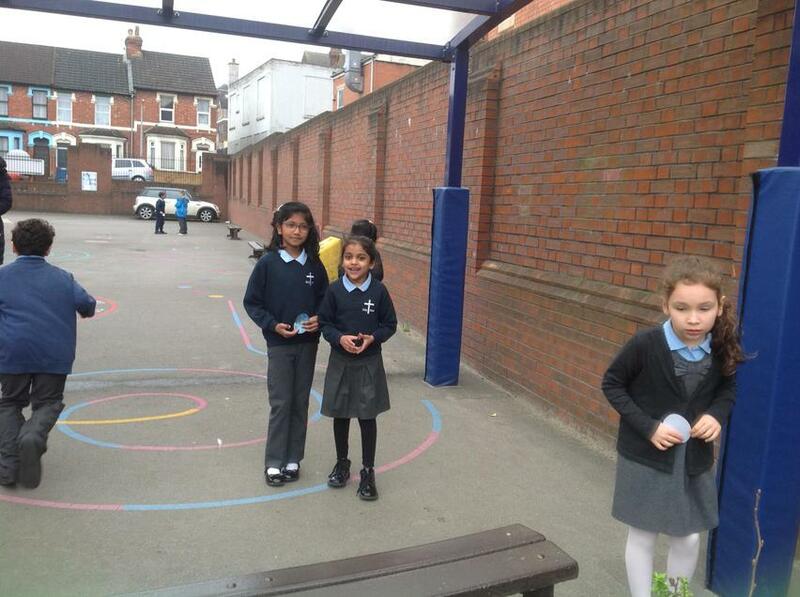 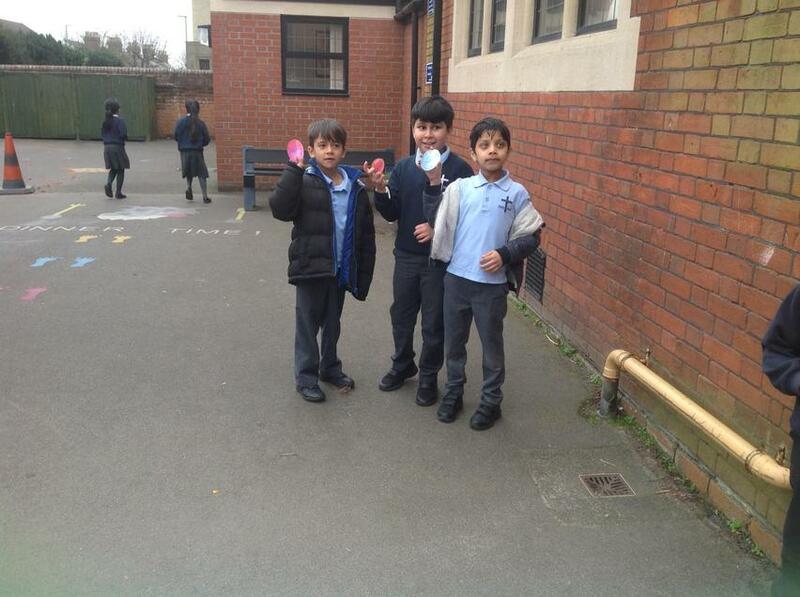 We went on a dragon egg hunt around the playground and wrote descriptions of the eggs we found. 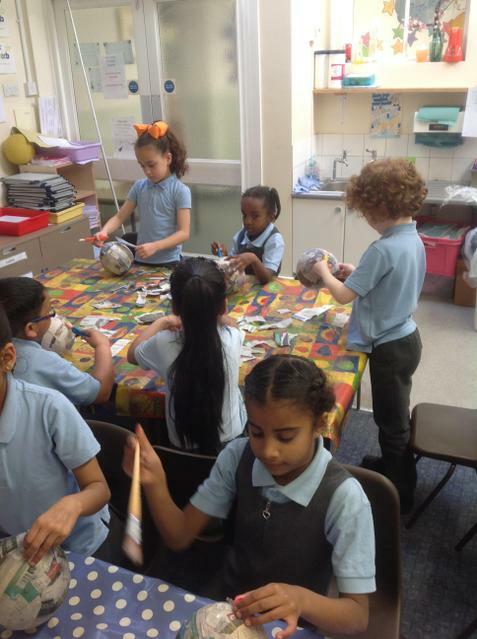 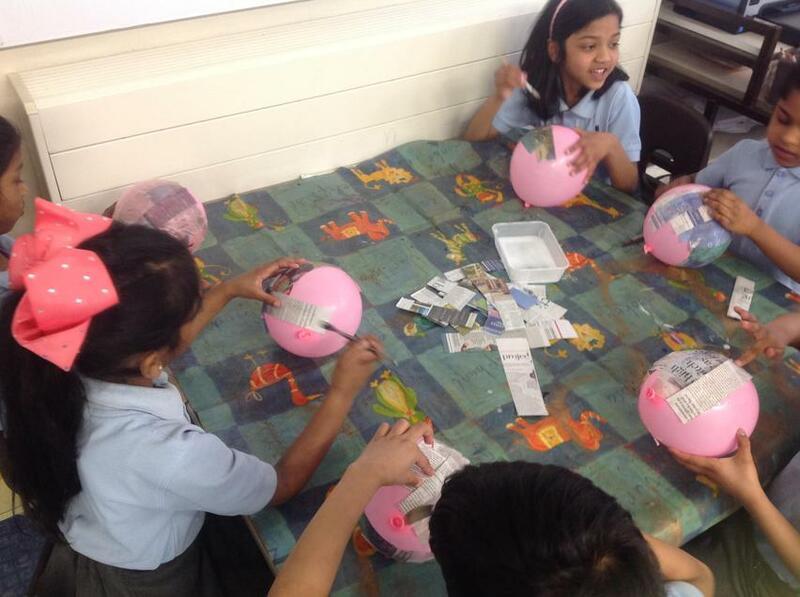 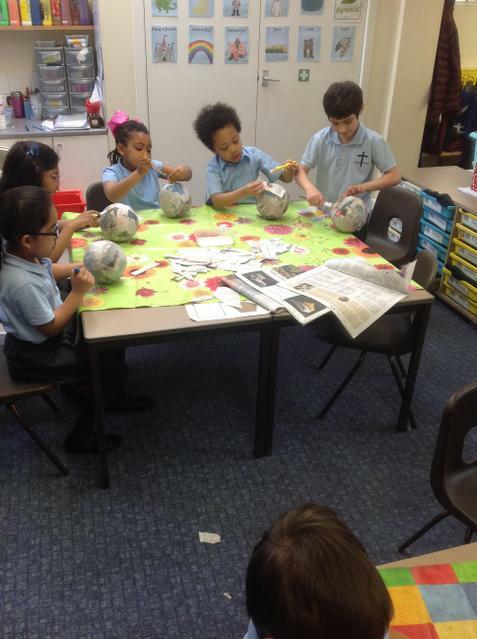 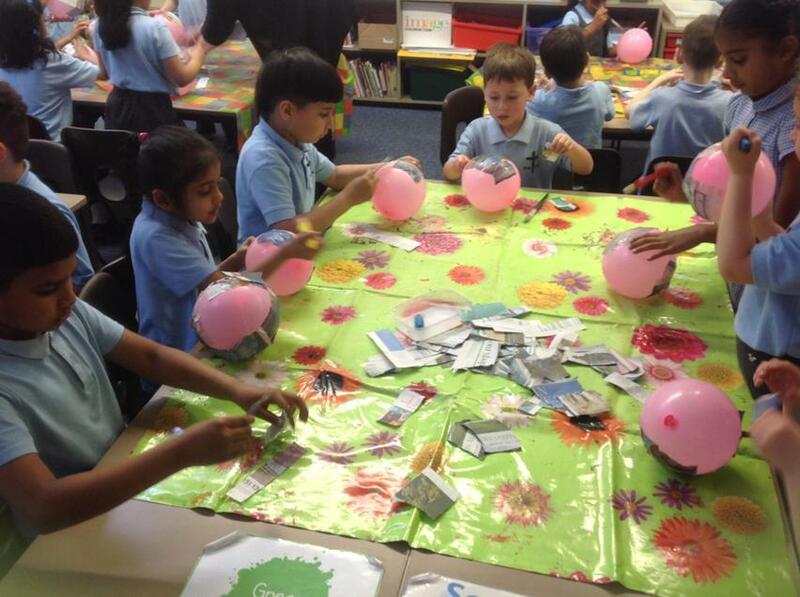 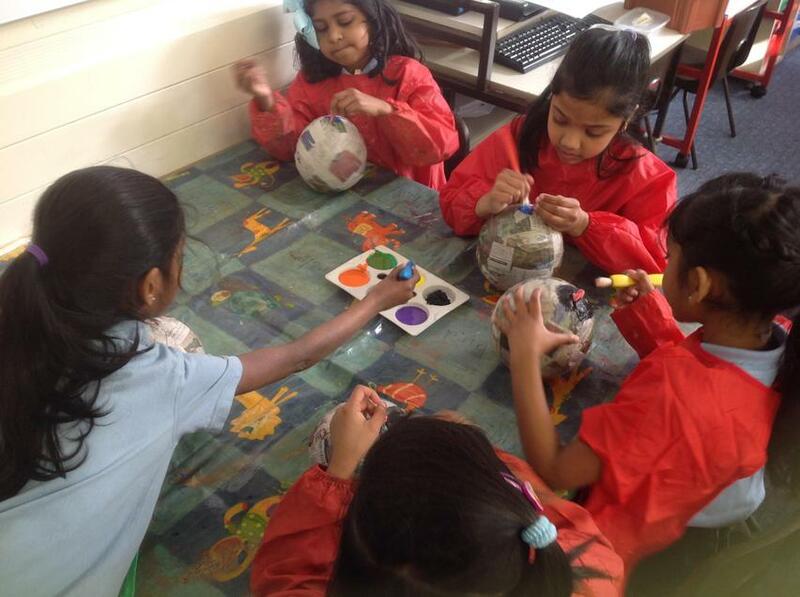 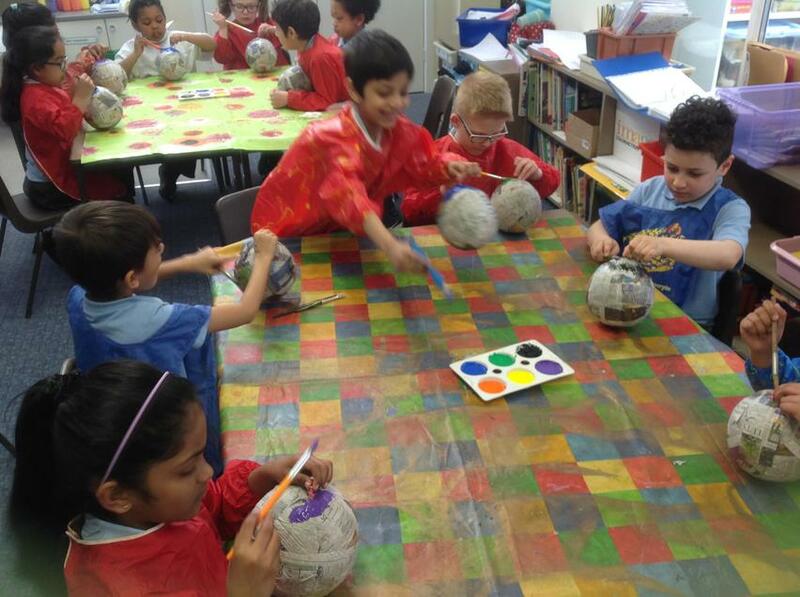 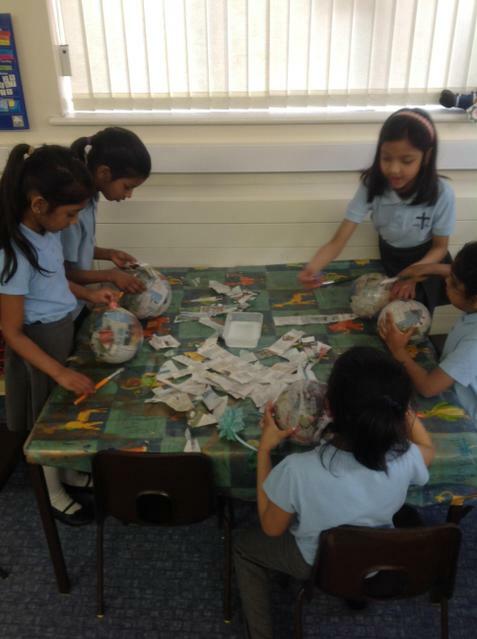 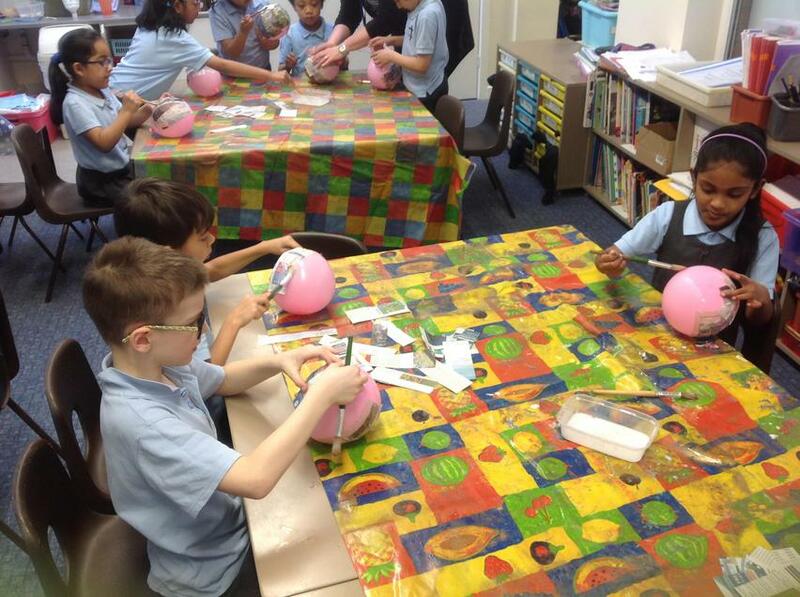 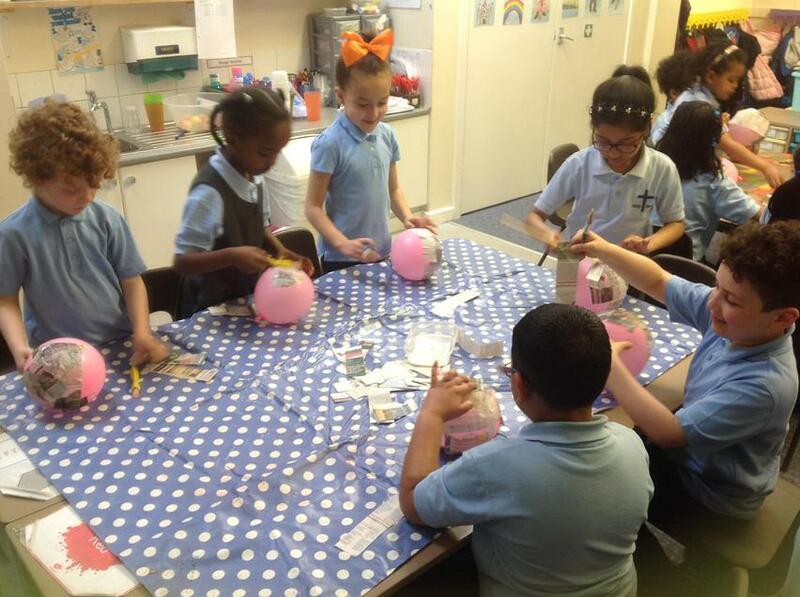 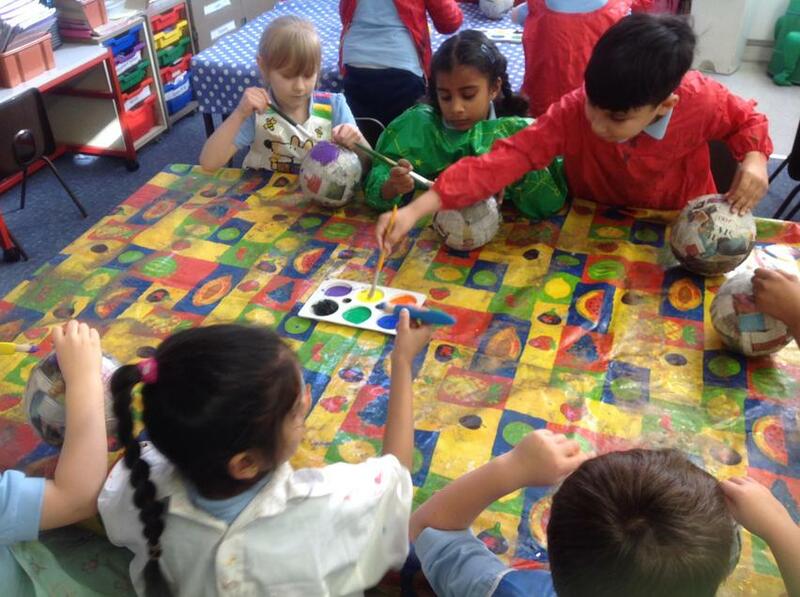 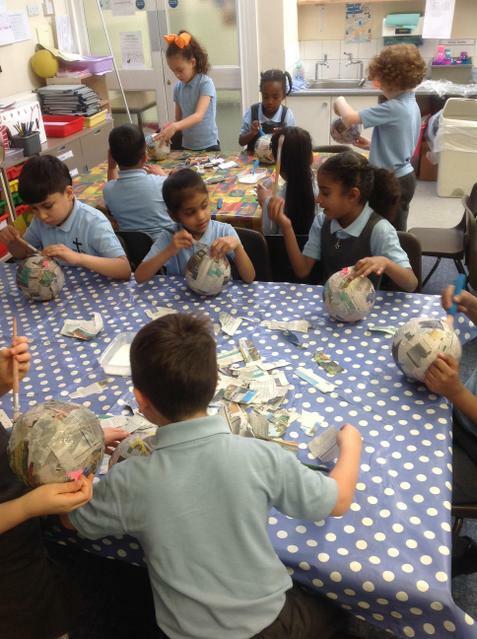 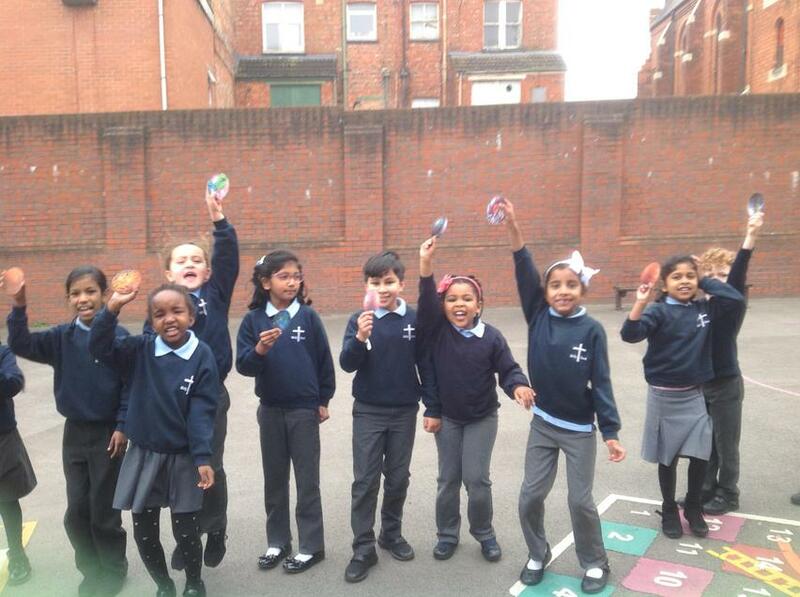 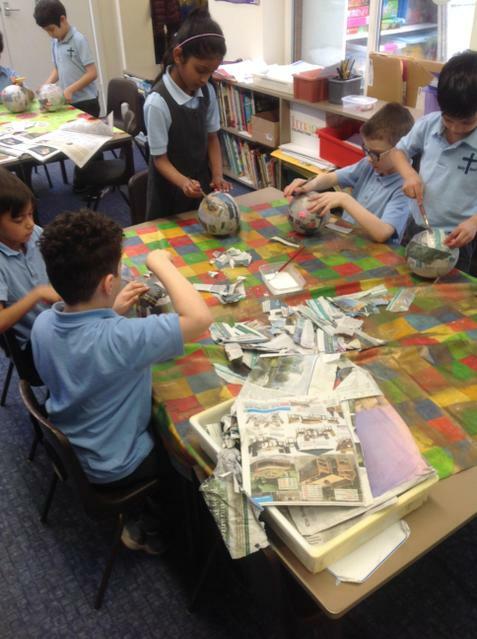 We then followed instructions to create our own dragon eggs using papier mache! 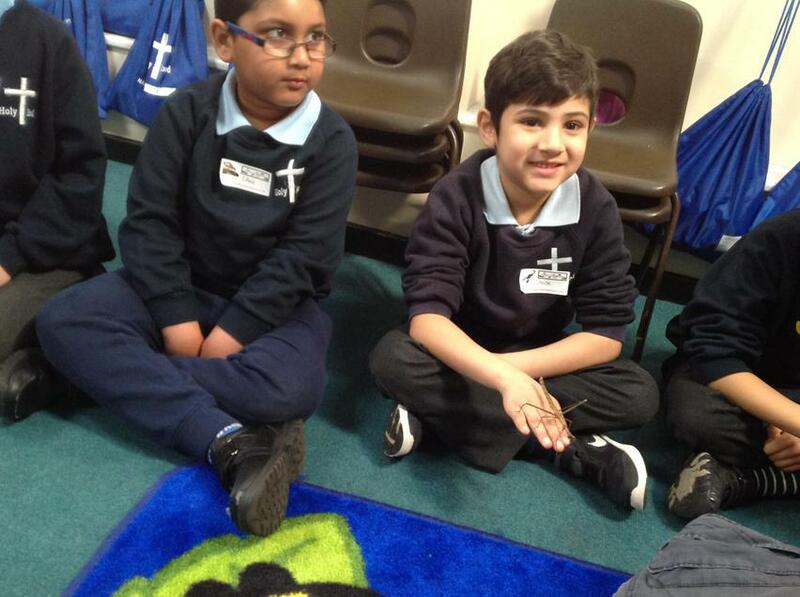 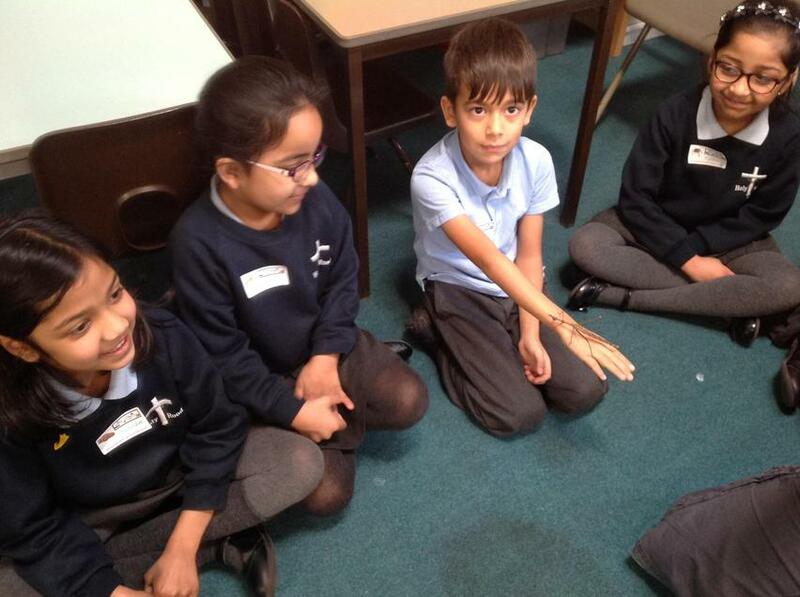 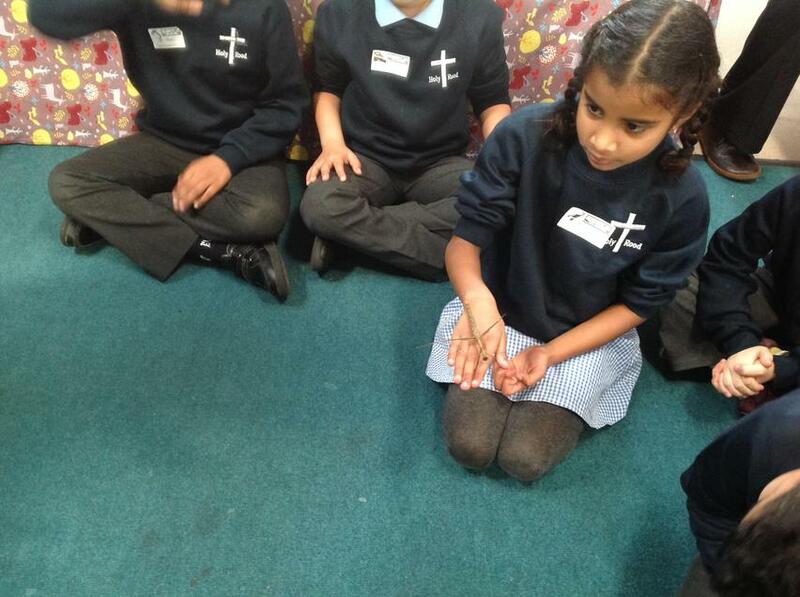 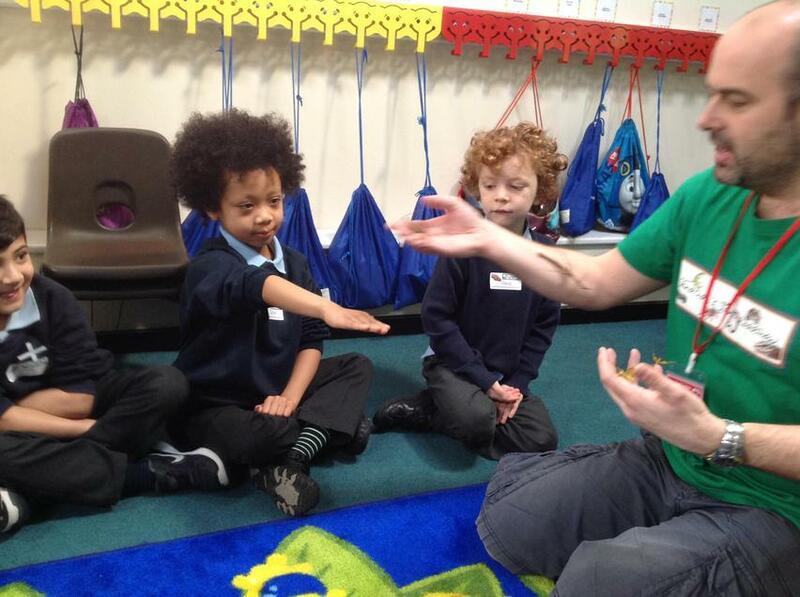 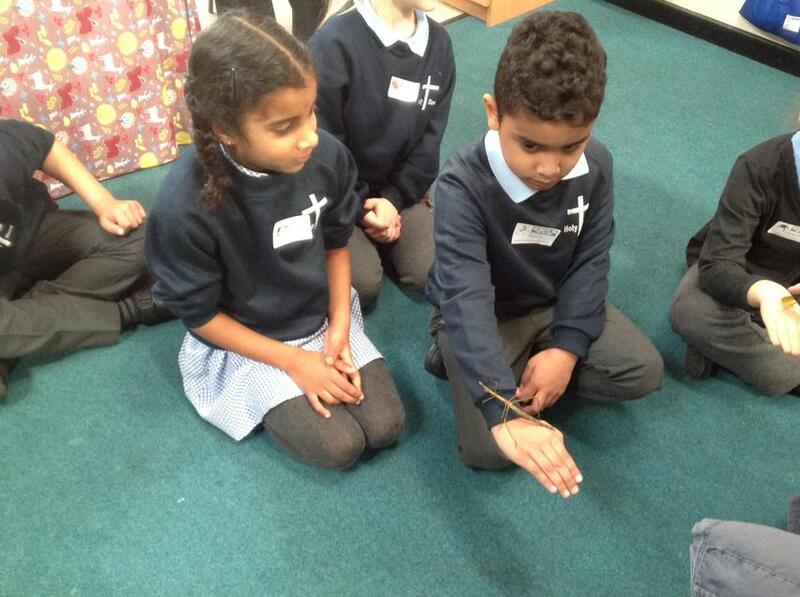 After that, we wrote instructions on how to look after a baby dragon." 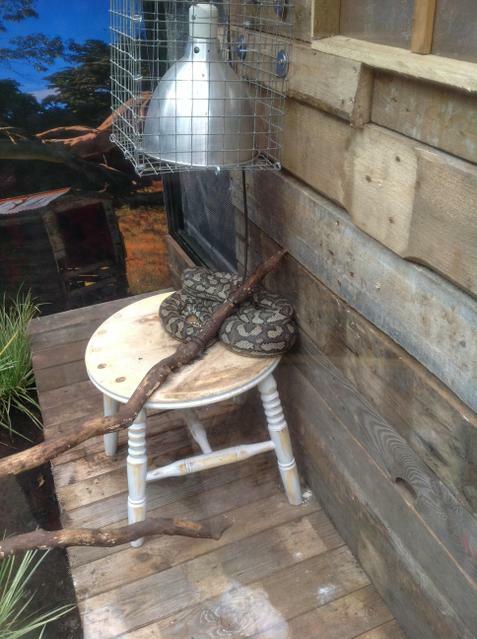 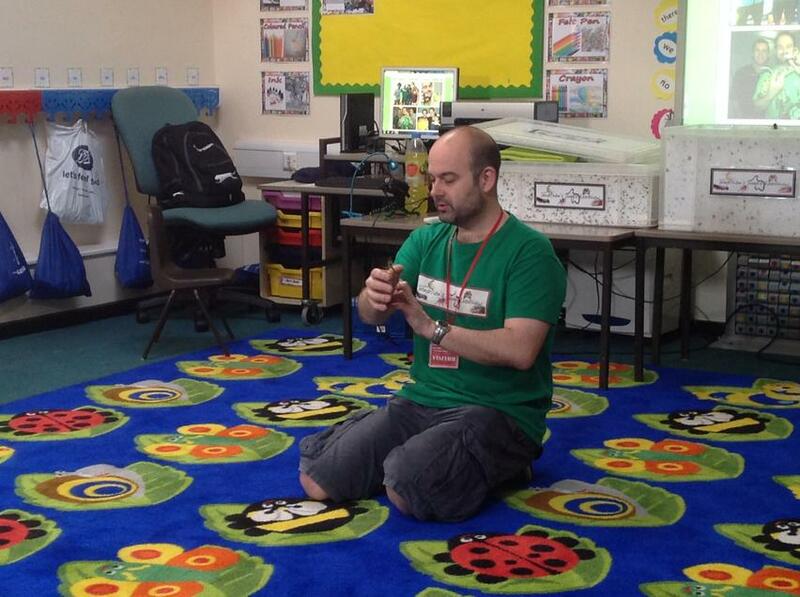 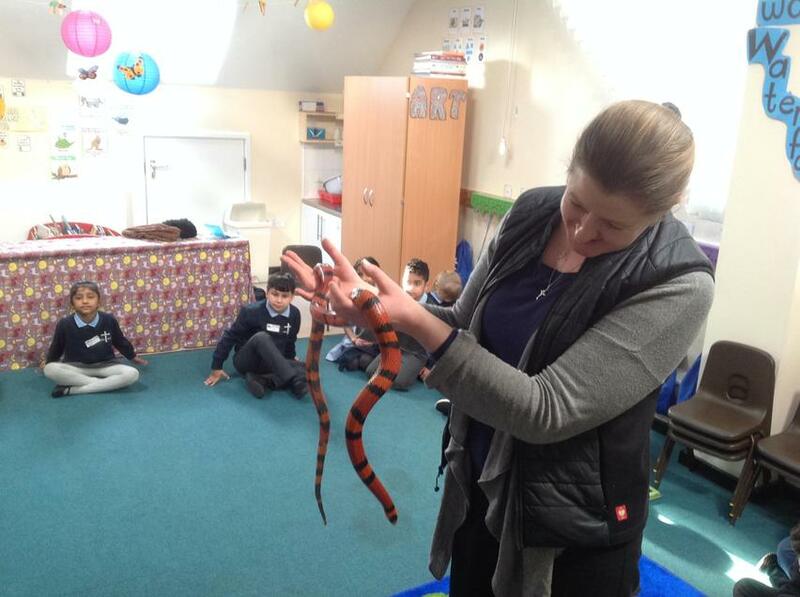 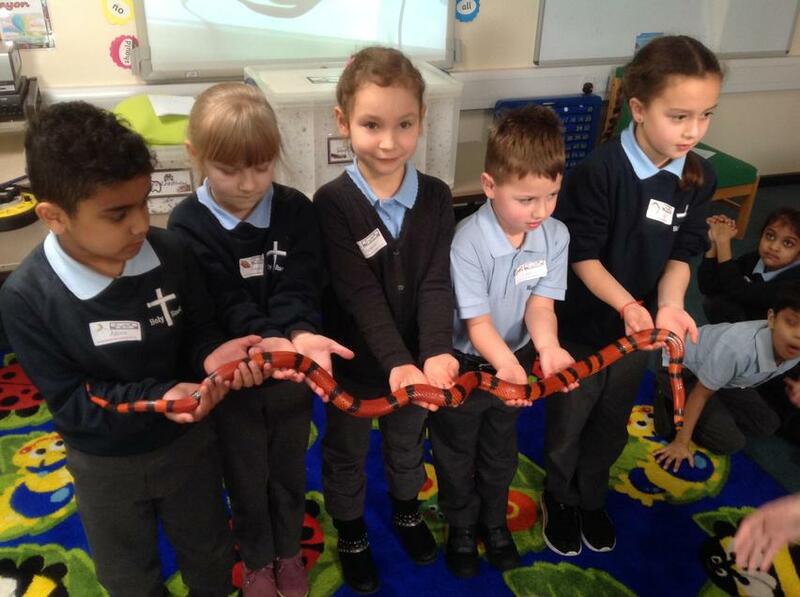 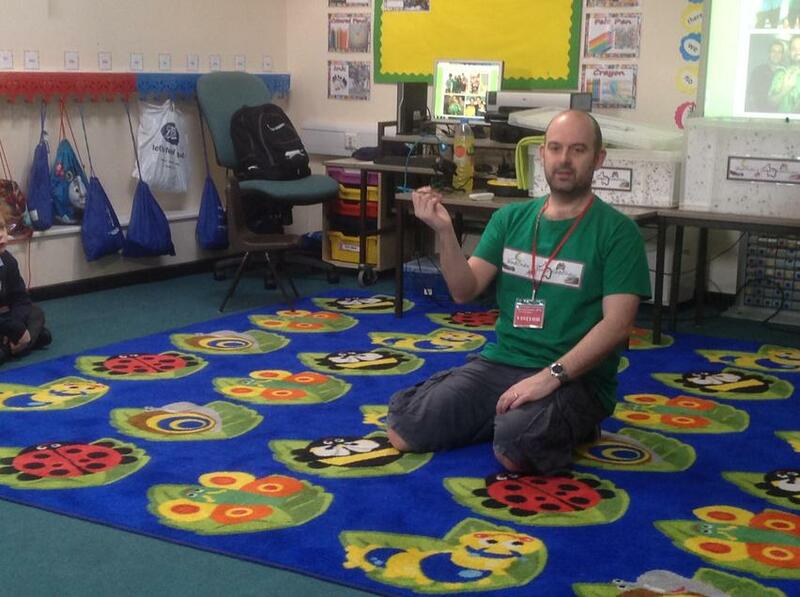 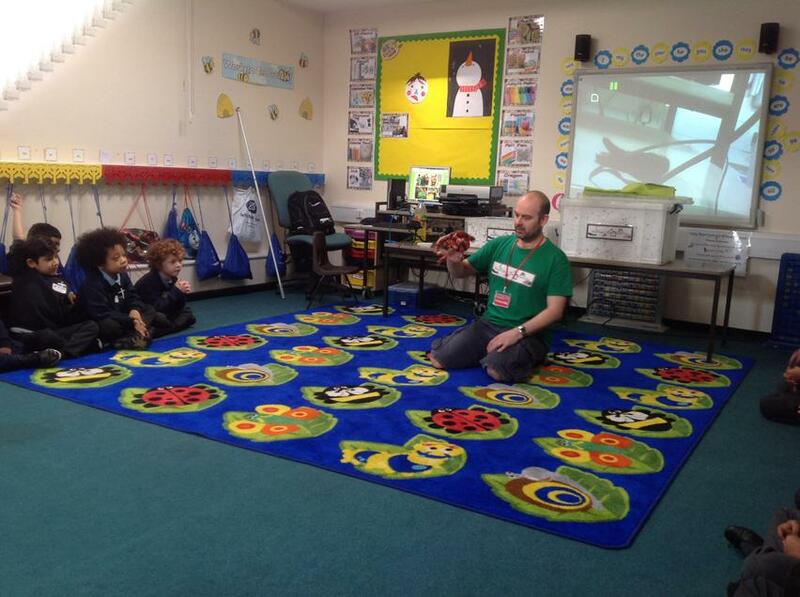 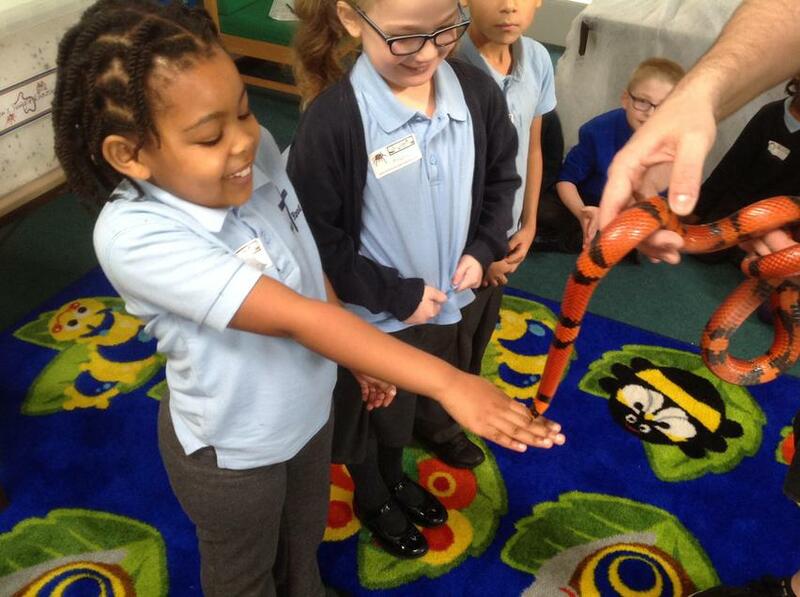 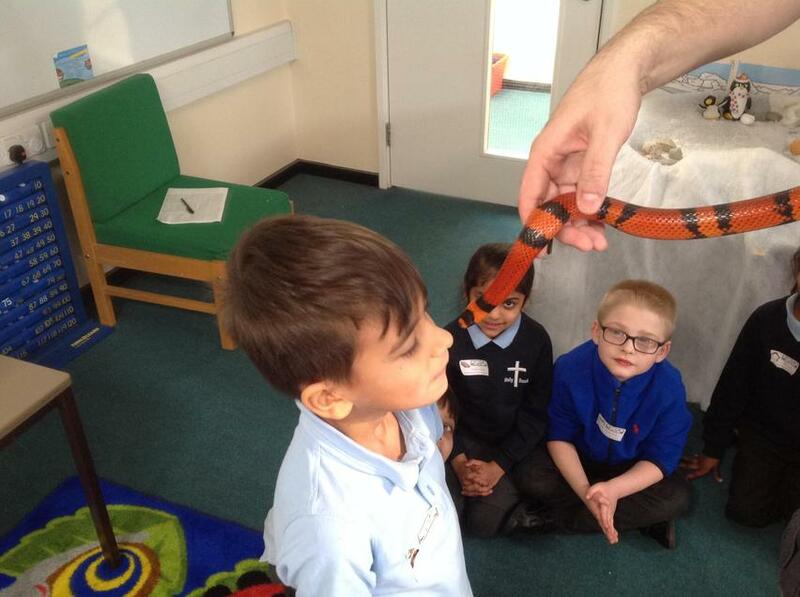 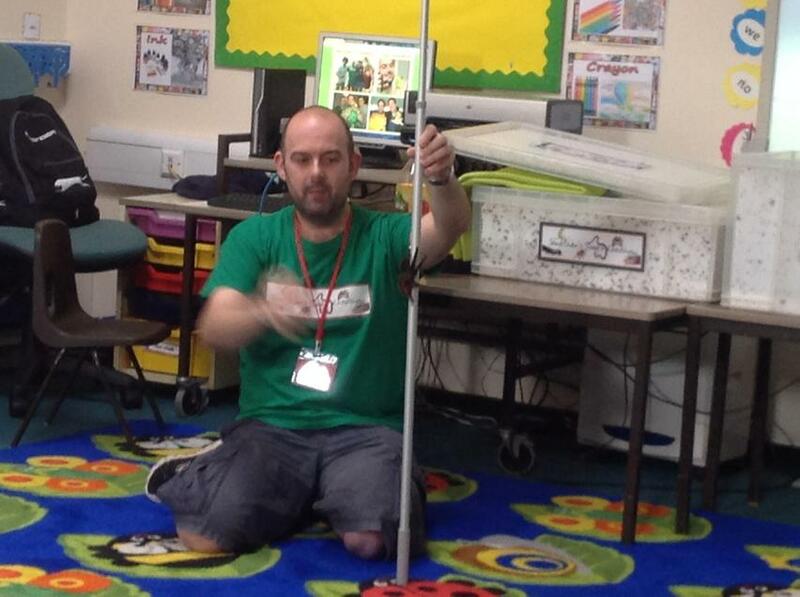 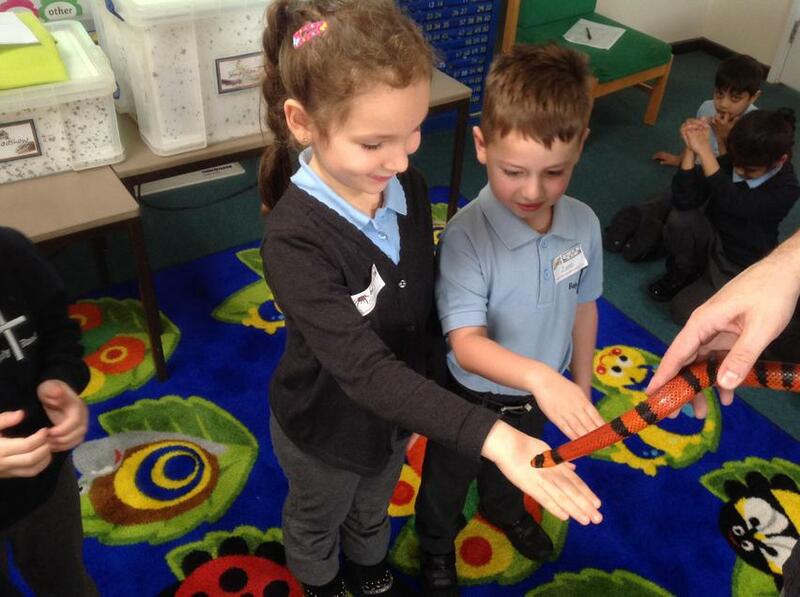 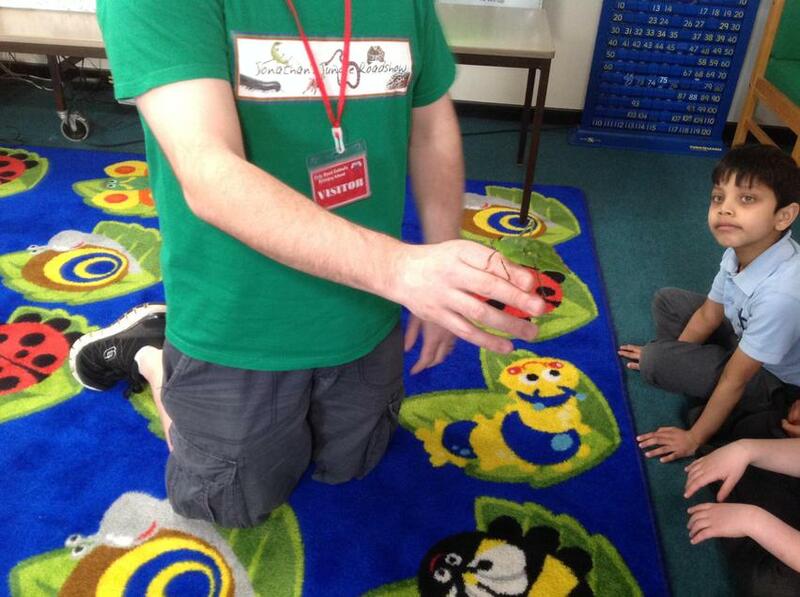 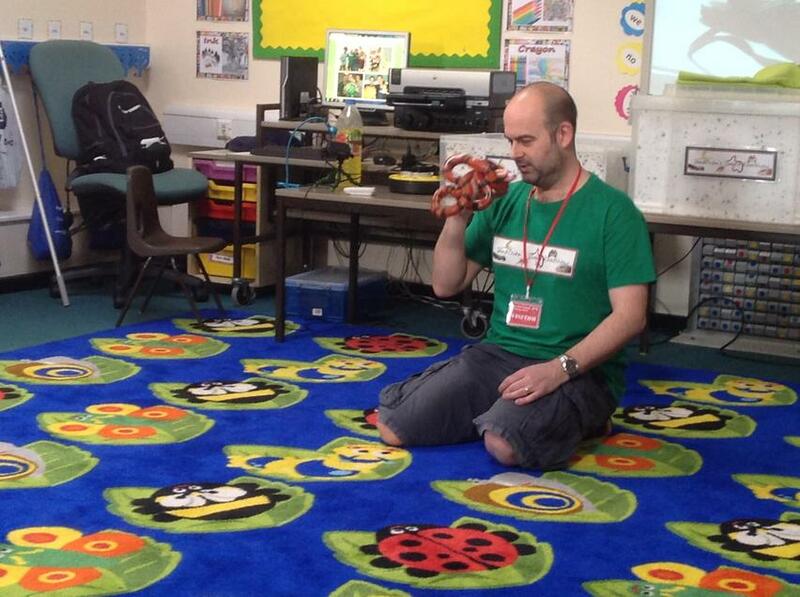 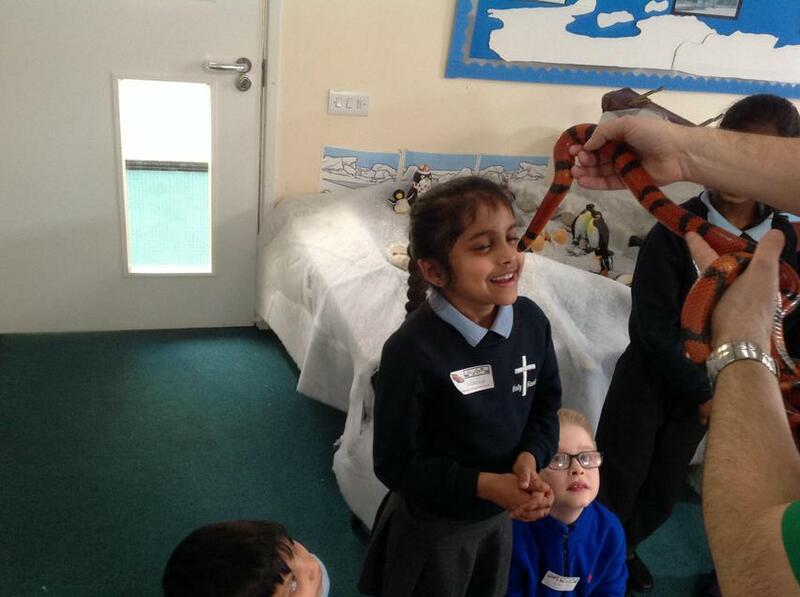 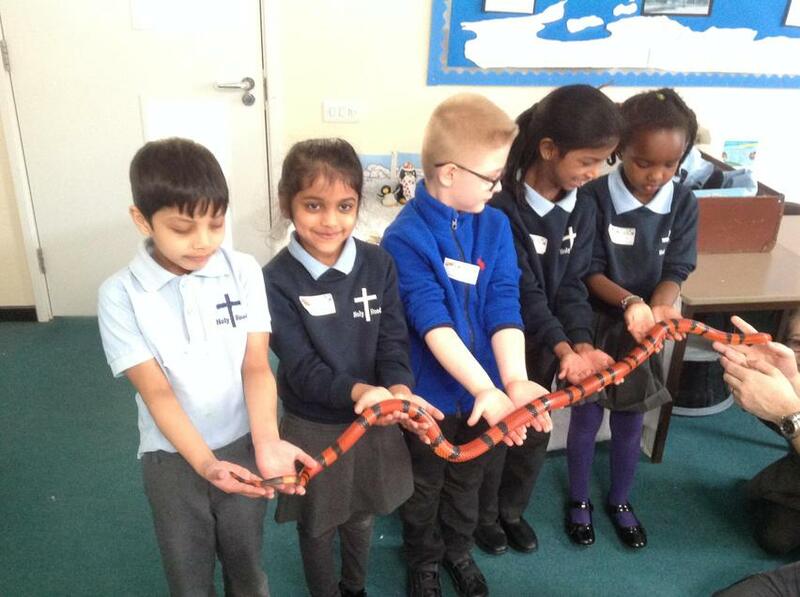 "Hedgehog Class had a fantastic morning... we met Jonathan and all of his amazing jungle animals! 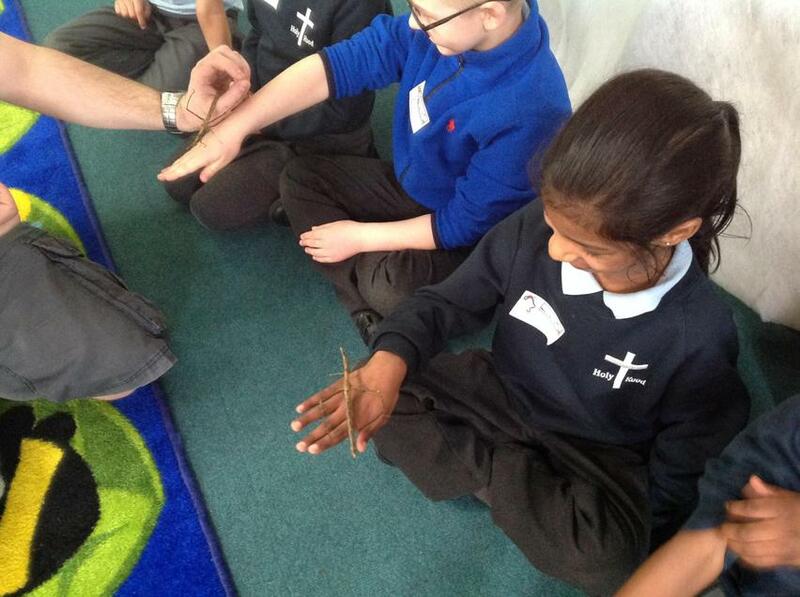 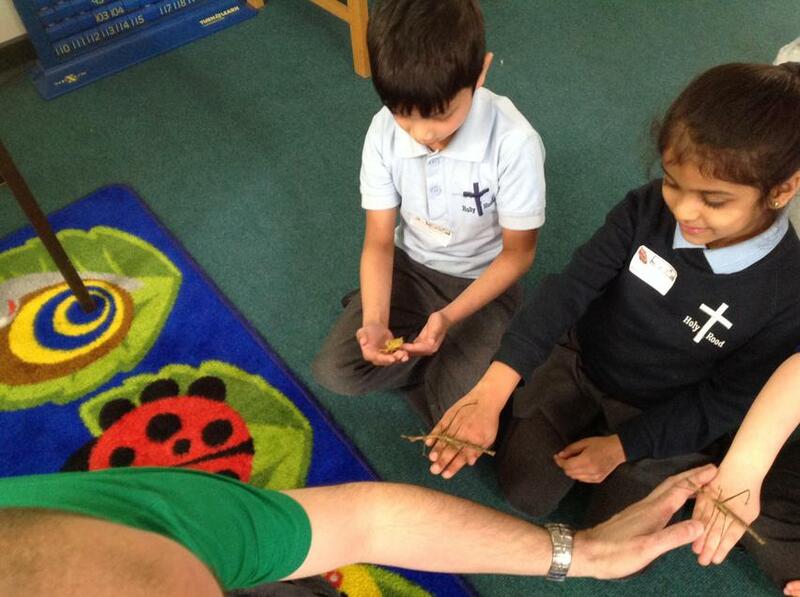 We were able to hold and learn about some amazing creatures such as snakes, spiders and some incredible camouflaged leaf insects. 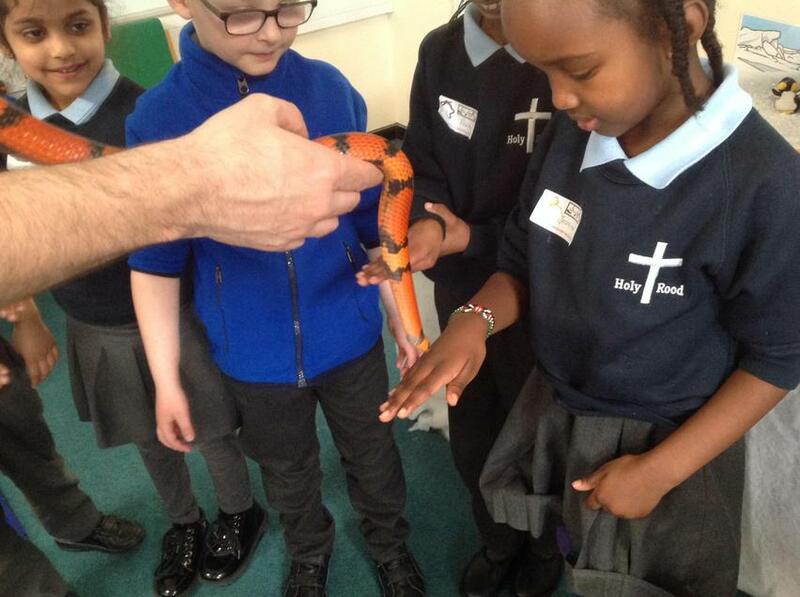 Jonathan even let the snake sniff our noses or hands with its tongue!" 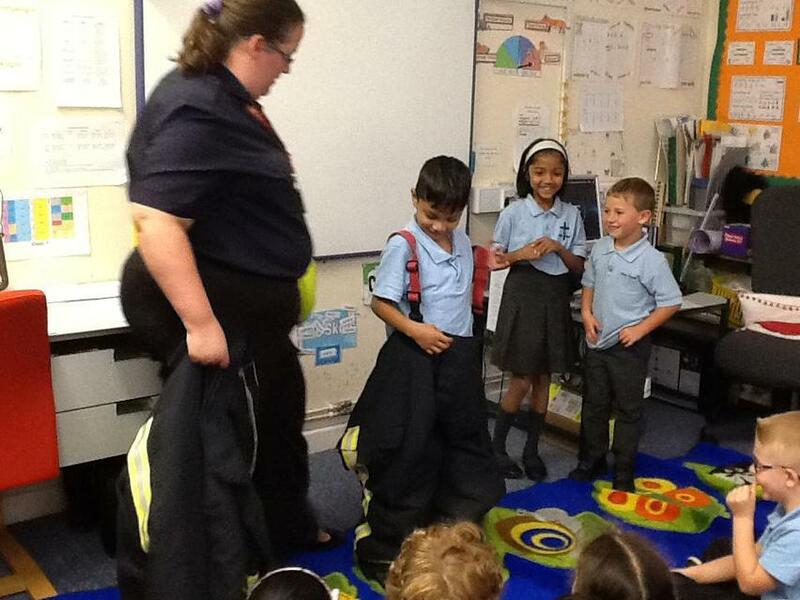 We had a mystery suitcase left in our classroom... we found out it belonged to an explorer called Mr Glacier! 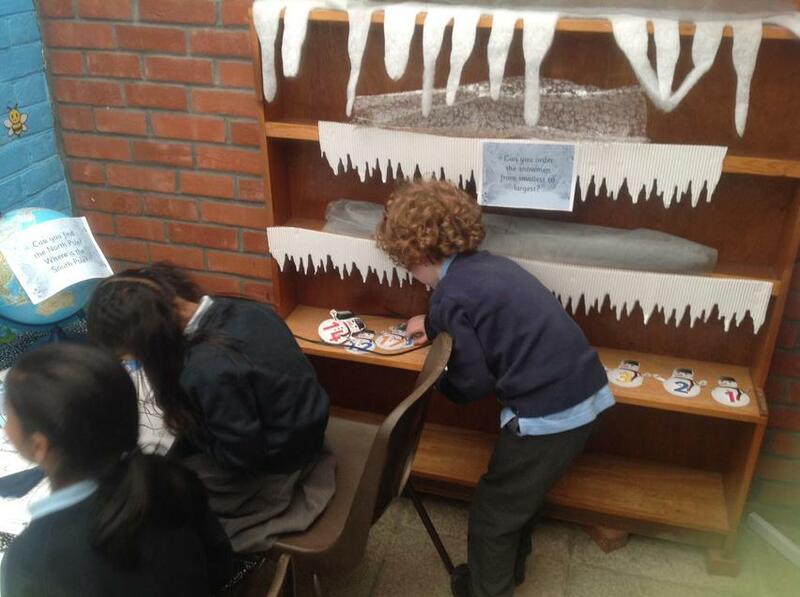 We have been researching Emperor Penguins to help Mr Glacier with his work. 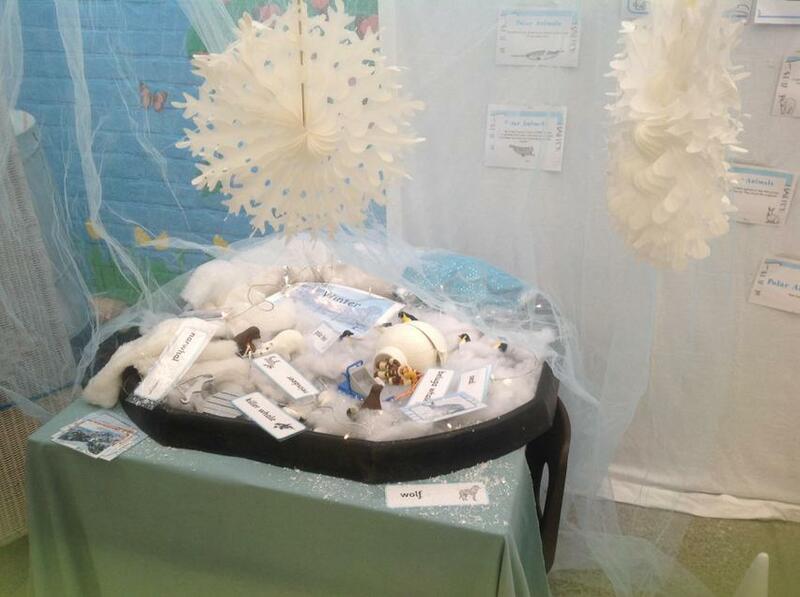 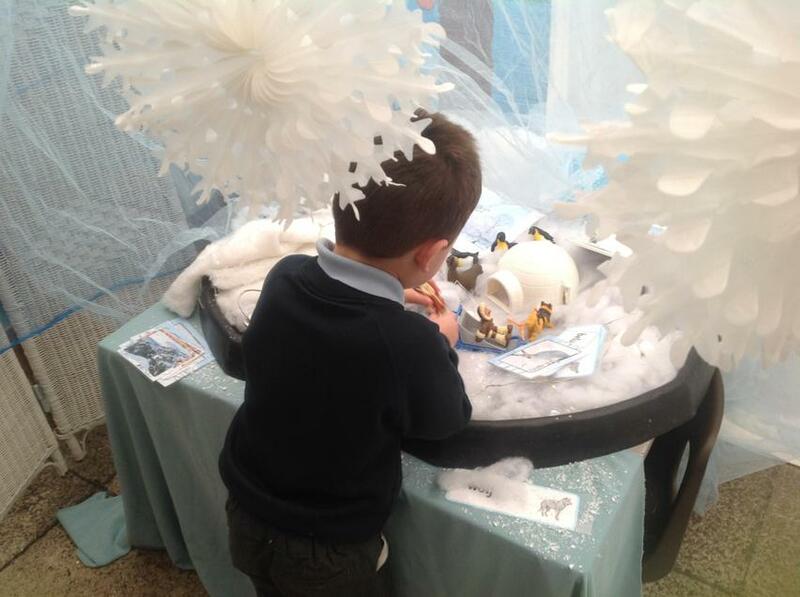 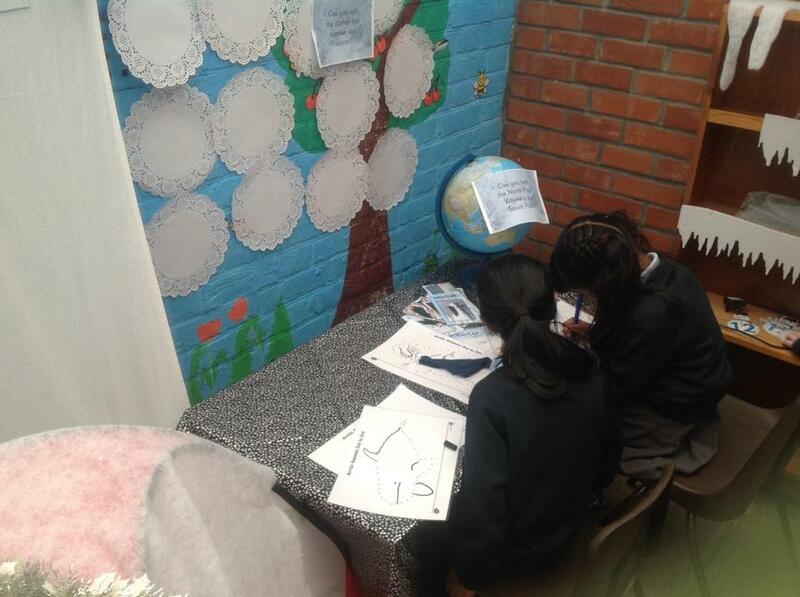 We have even made our own Antarctica in our play area! 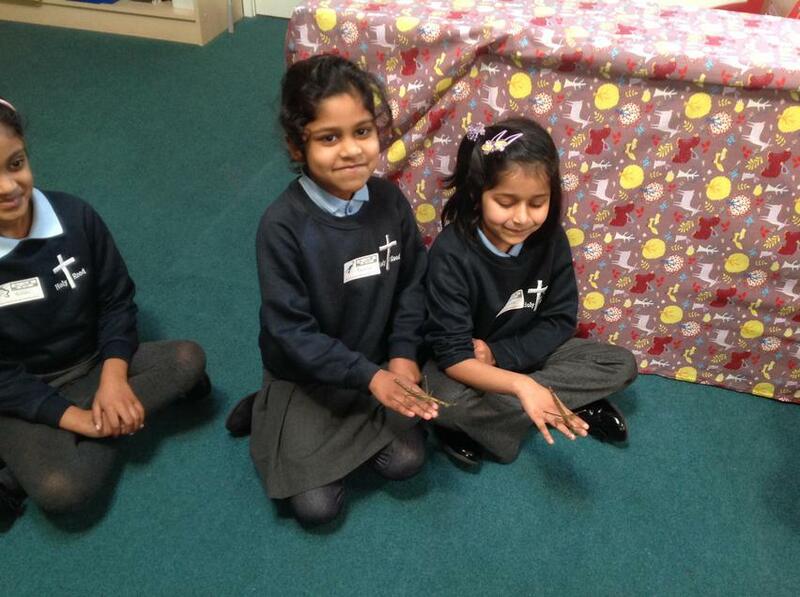 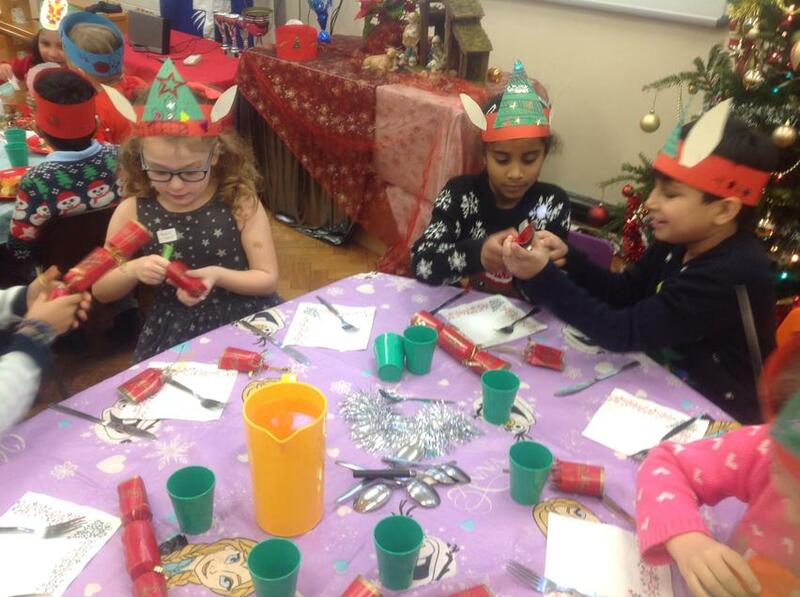 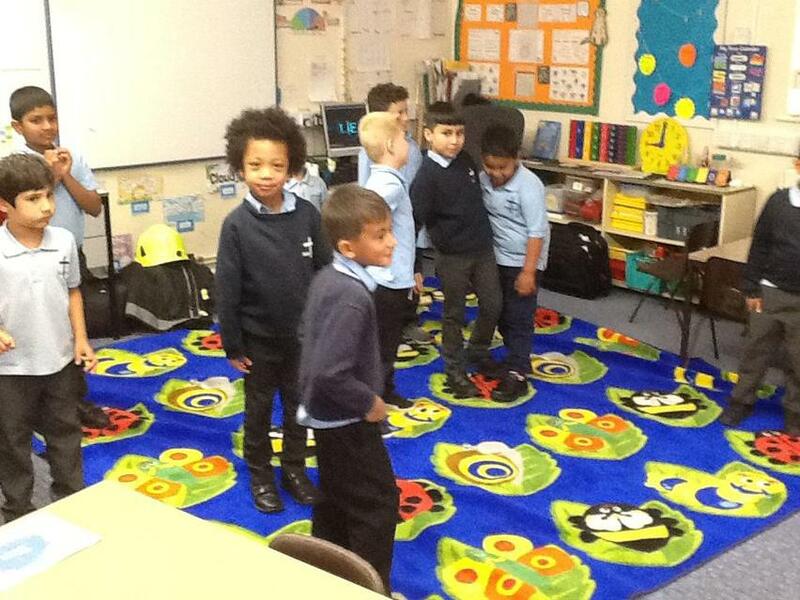 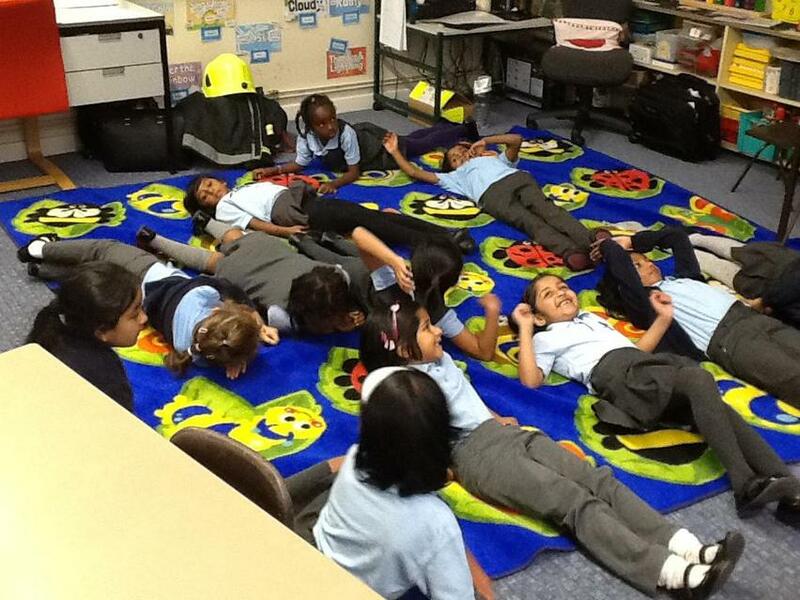 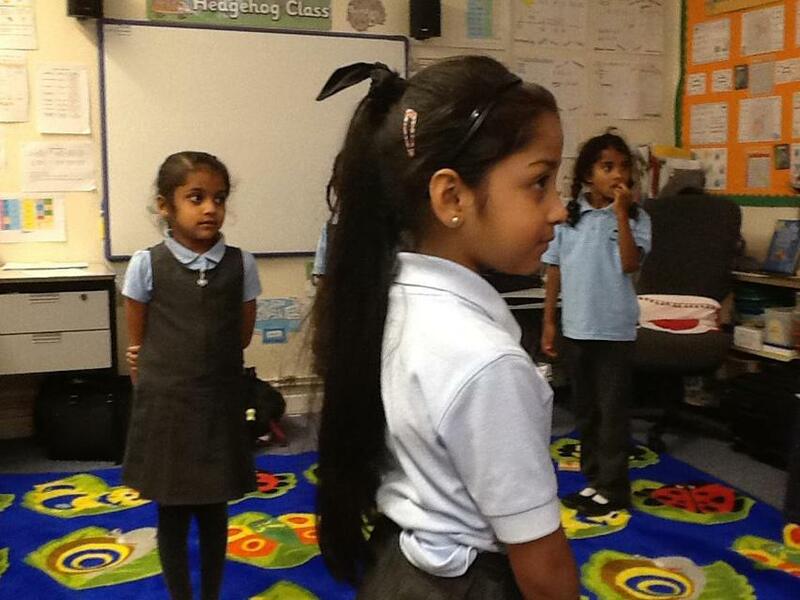 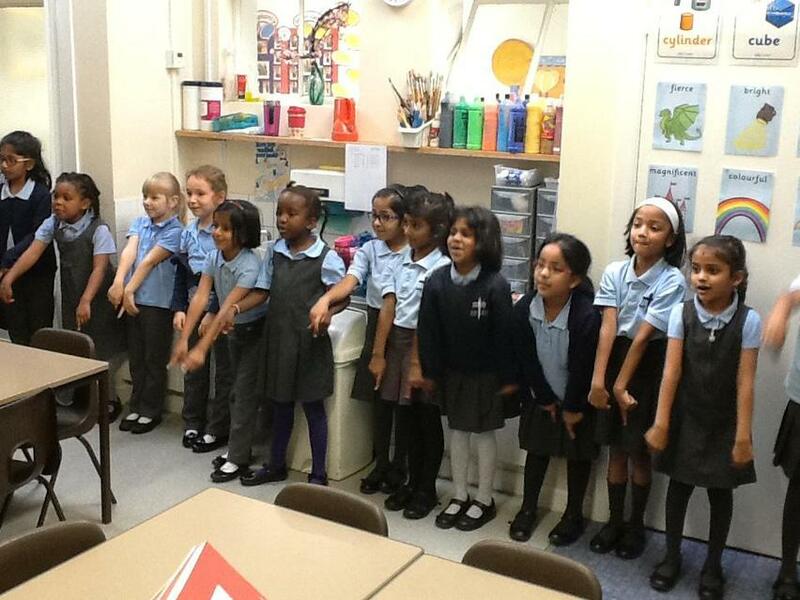 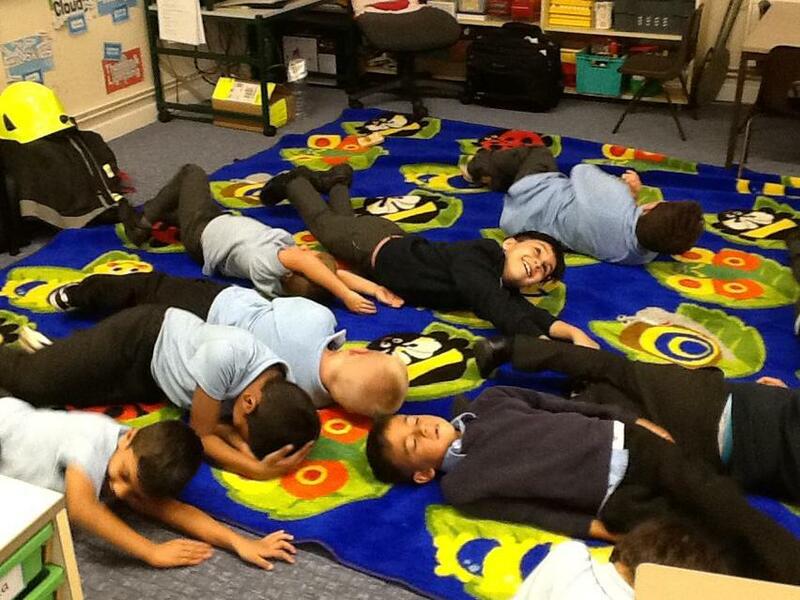 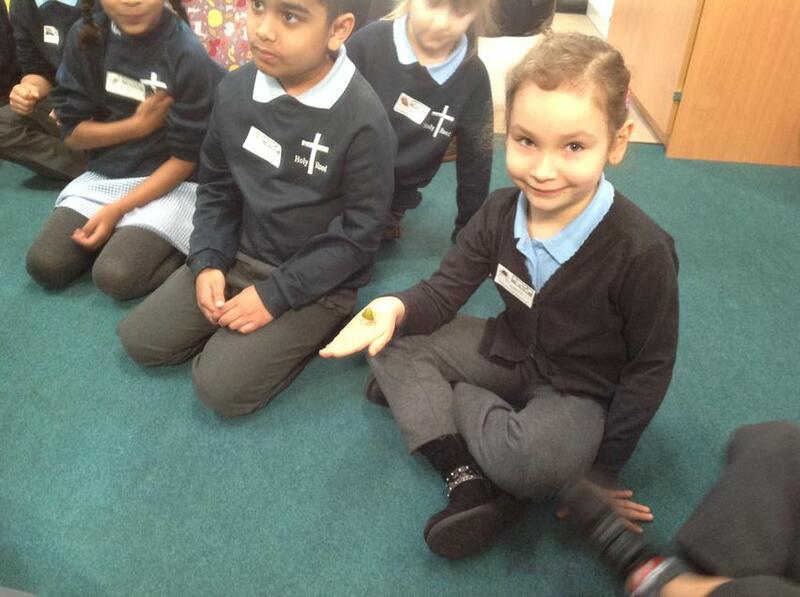 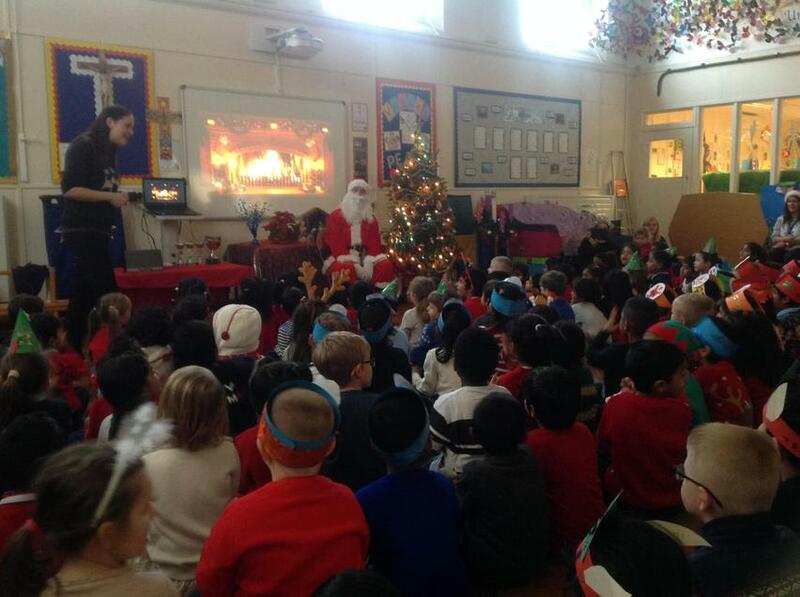 "We had a wonderful Christmas in Hedgehog Class! 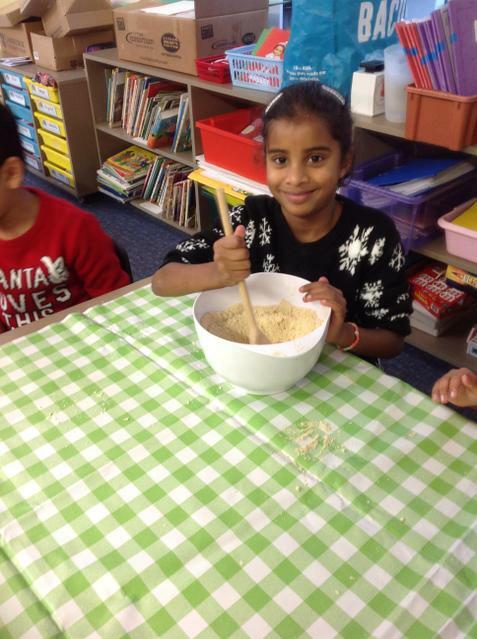 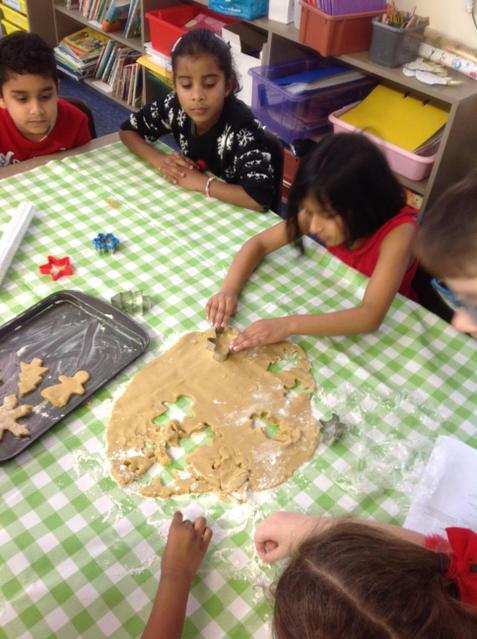 We enjoyed a Christmas lunch, a visit from Santa and we baked gingerbread cookies!" 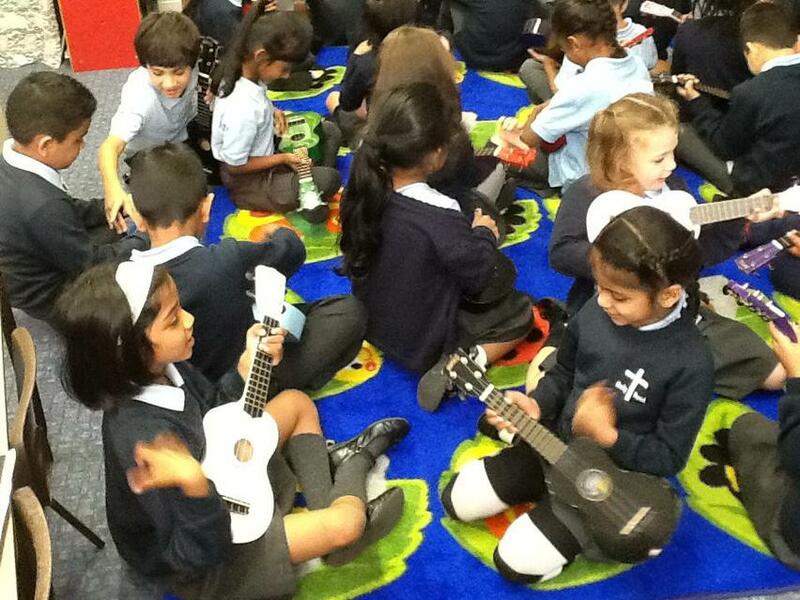 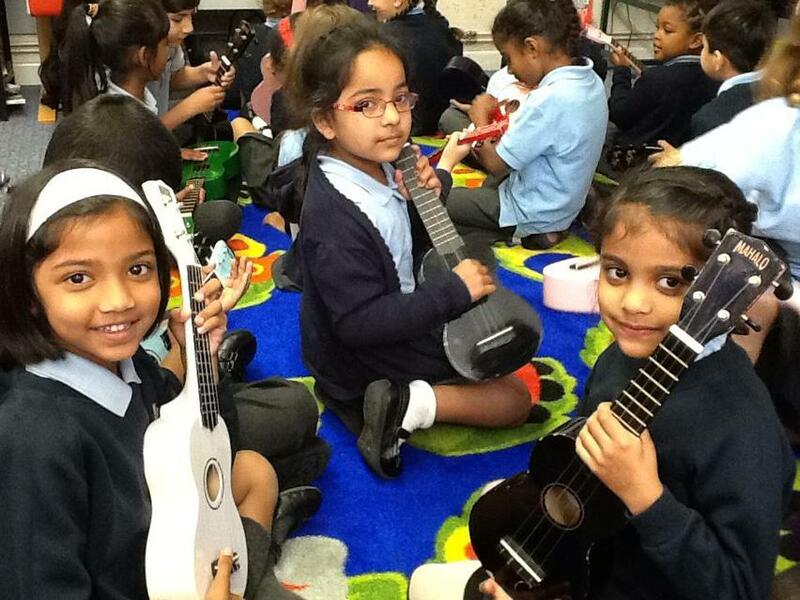 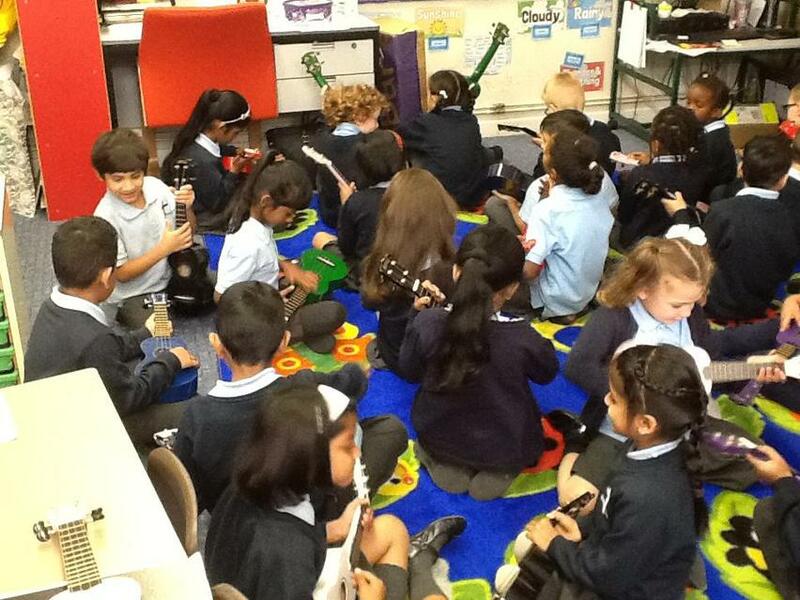 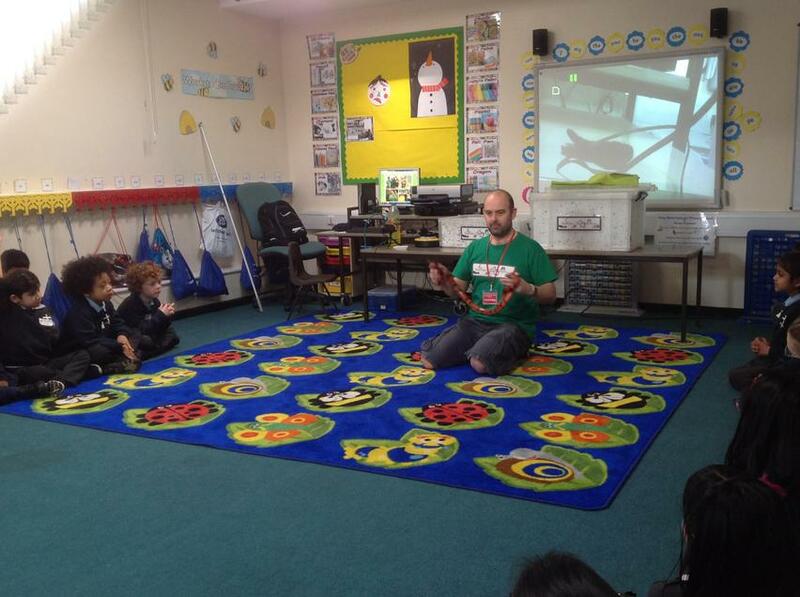 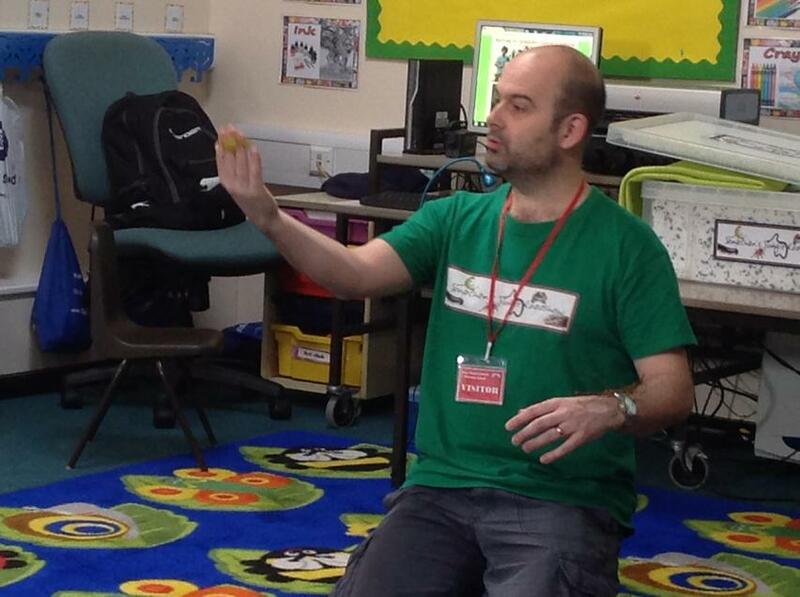 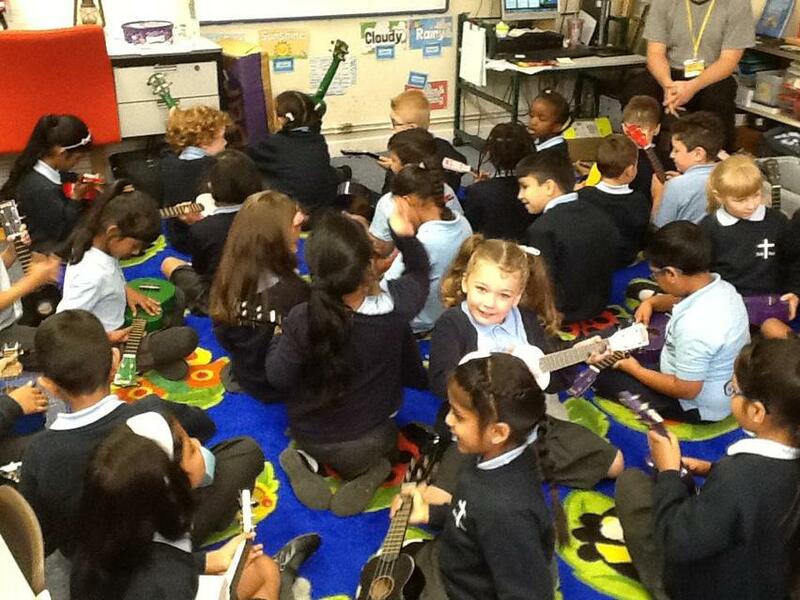 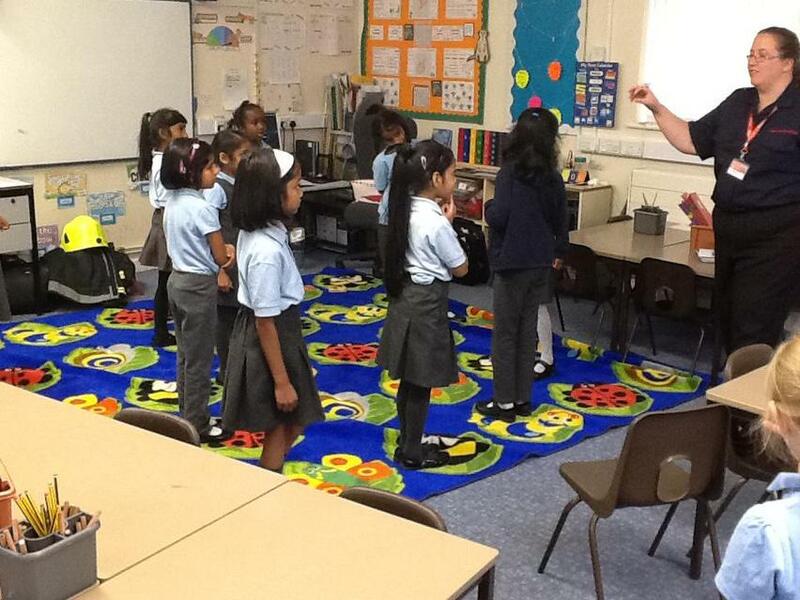 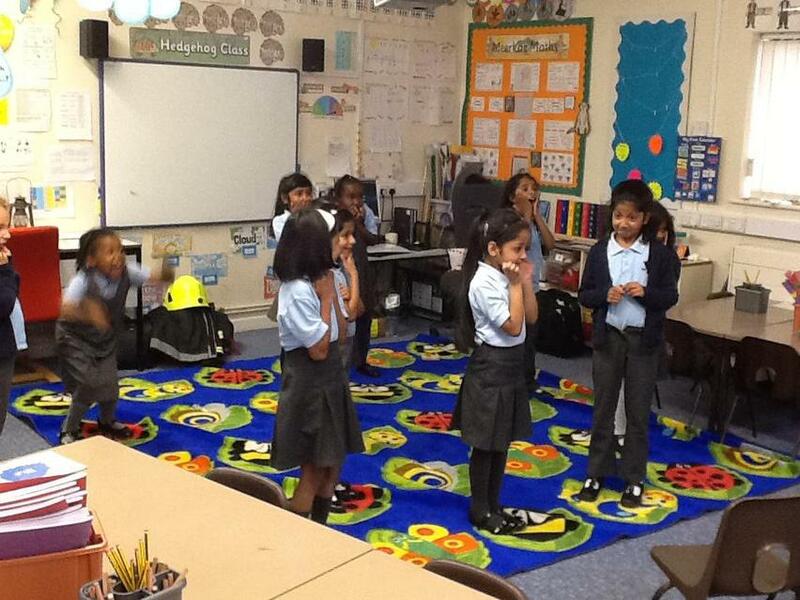 "Hedgehogs are learning how to play the ukulele with Mr Andrews. 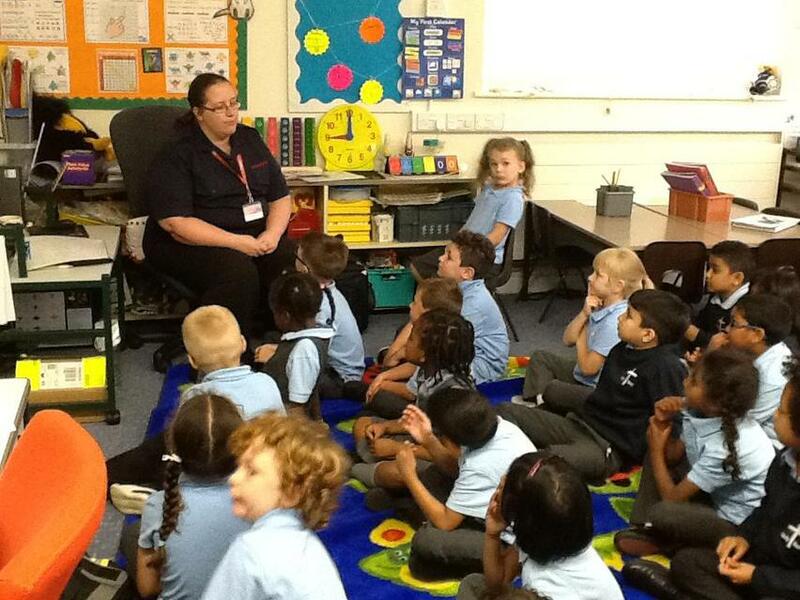 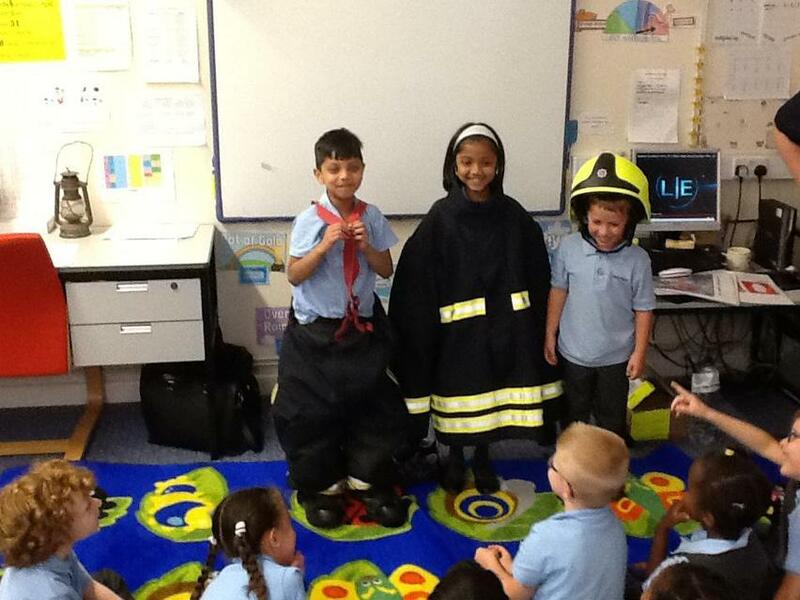 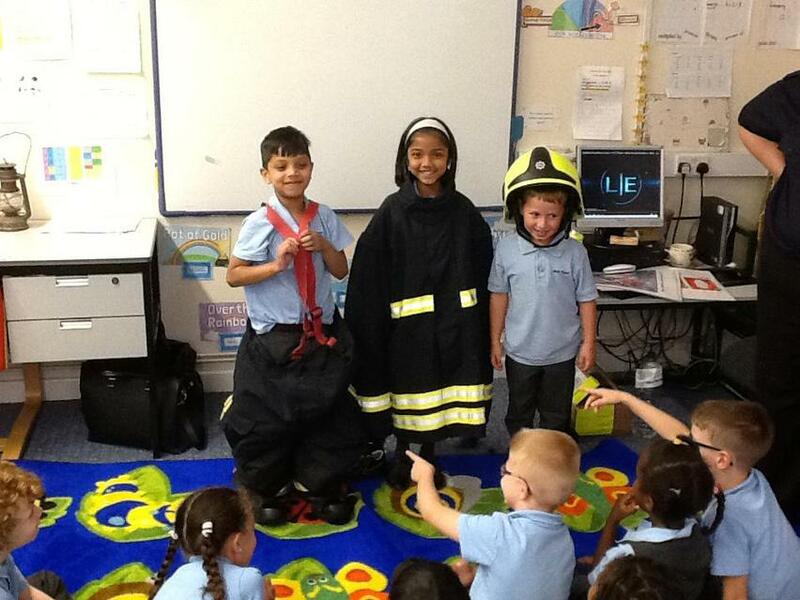 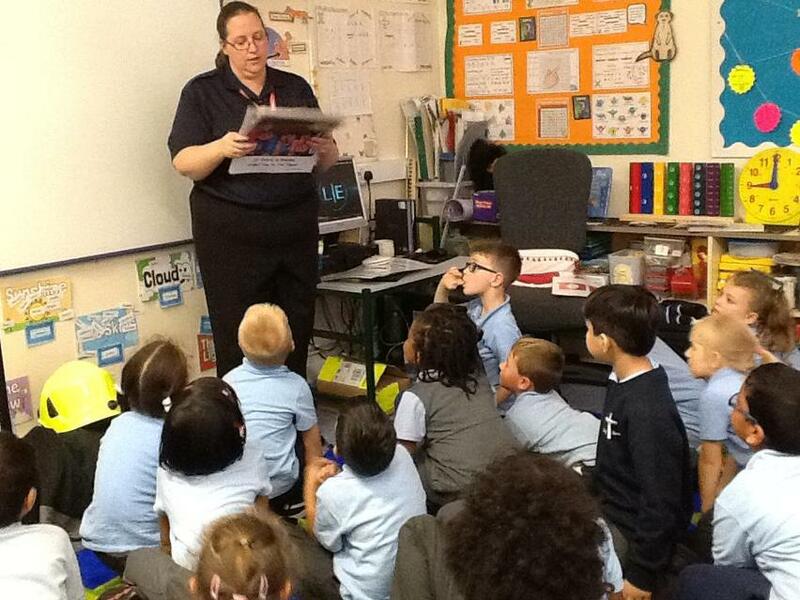 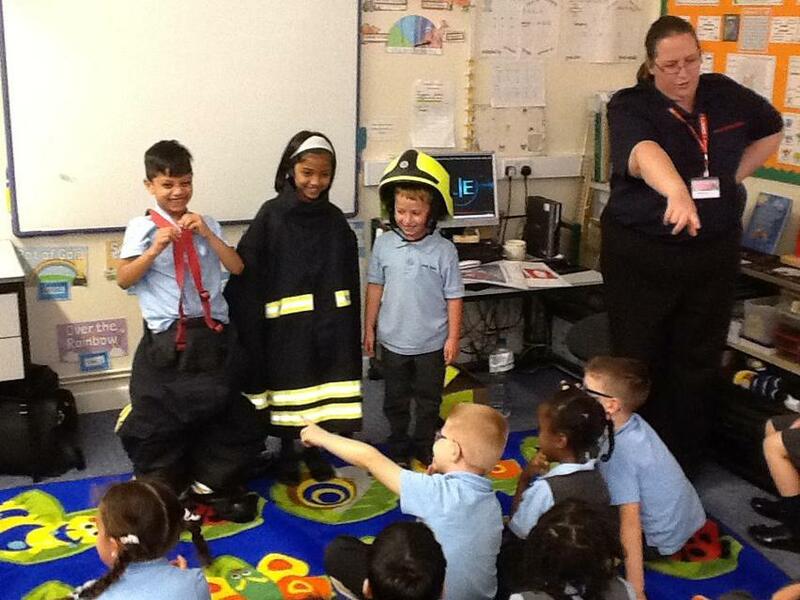 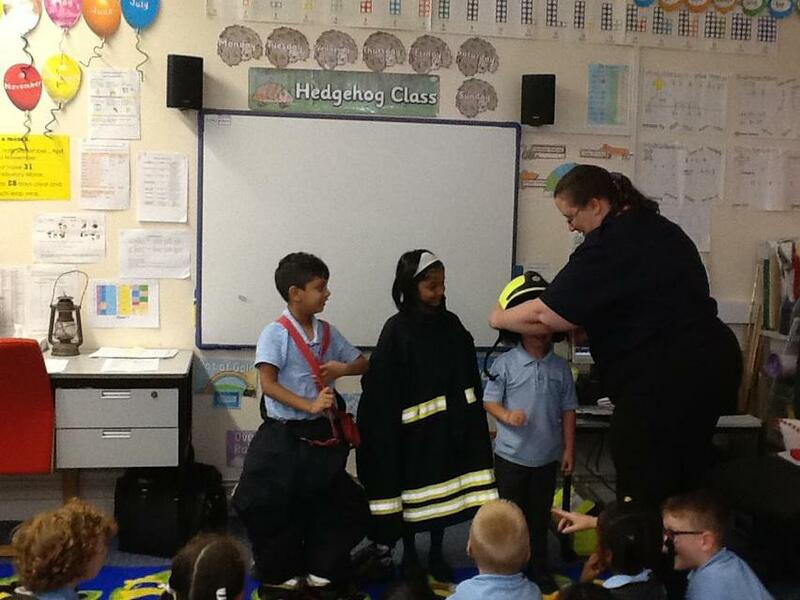 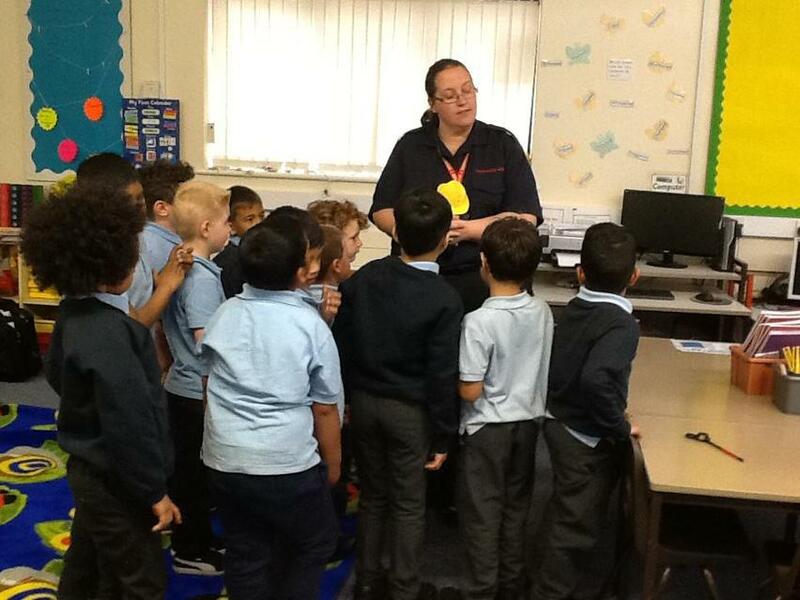 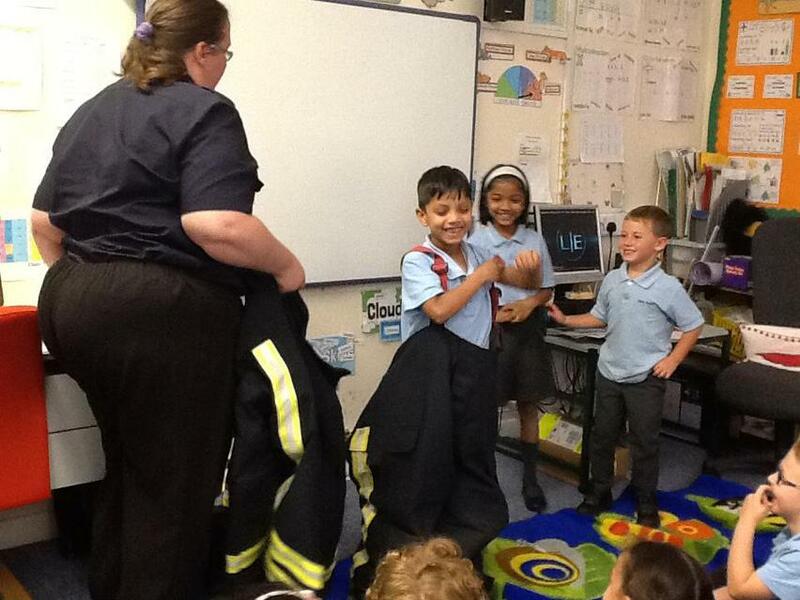 We had such a fun first lesson and we can't wait to learn some songs..."
"We had a special visitor from the Fire Service. 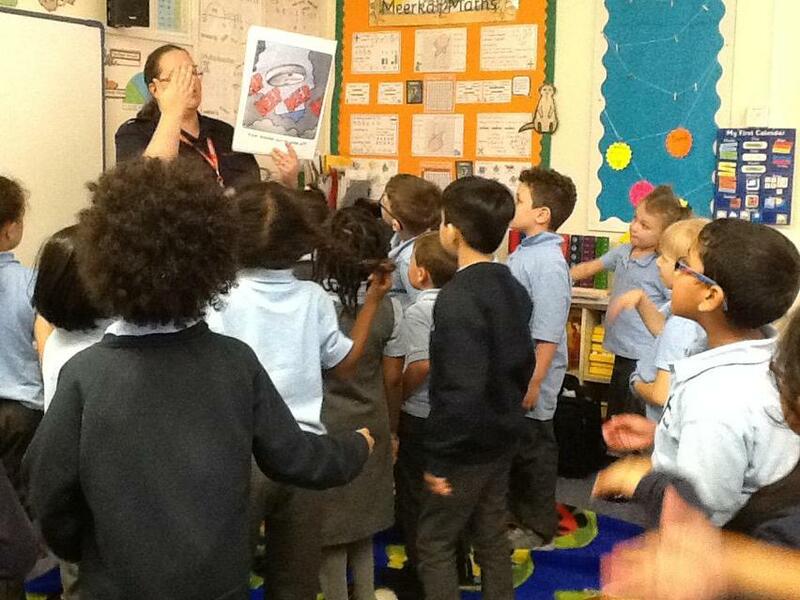 She taught us all about how to stay safe at home and in school. 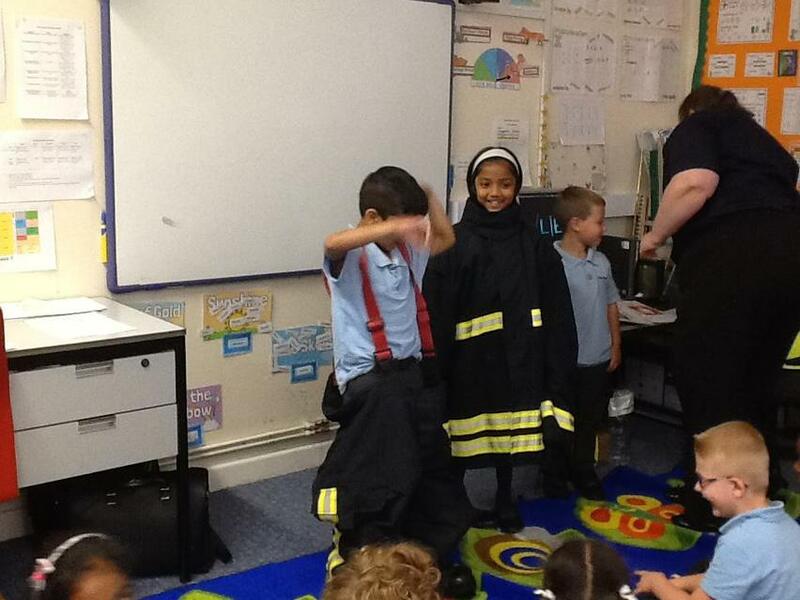 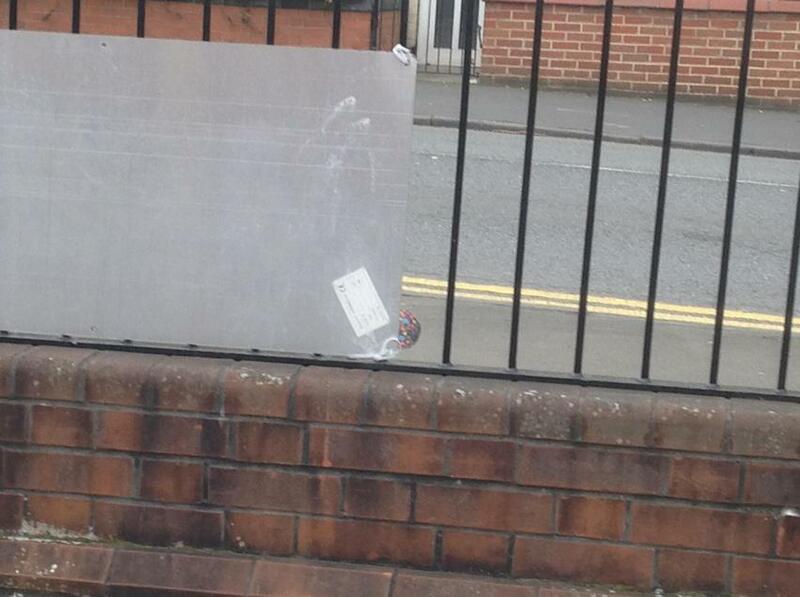 We must remember that if we every caught fire we should STOP, DROP and ROLL"